Blimey, the weather forecast offered another dry day, that’s two days in a row! Even better was that it would be warmer and mostly sunny once the heavy overnight rain cleared off eastwards. Warm? Sunny? 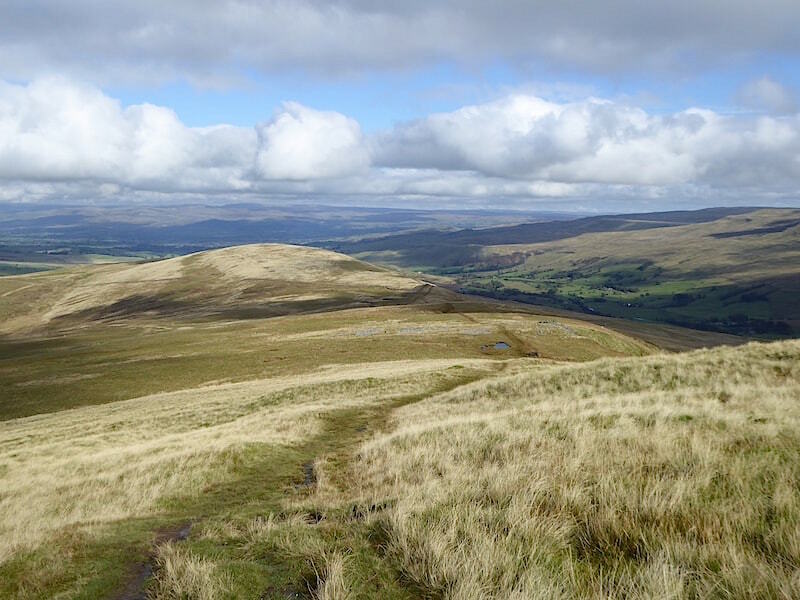 We’ve almost forgotten what that feels like so, to make the most of this unusual weather event, we decided that we’d go and take a walk over Wild Boar Fell above the Mallerstang Valley on the Cumrbia/Yorkshire border. Its moorland country and there’ll be some heavy and prolonged rain overnight, best put the waterproof socks on right from the start then! 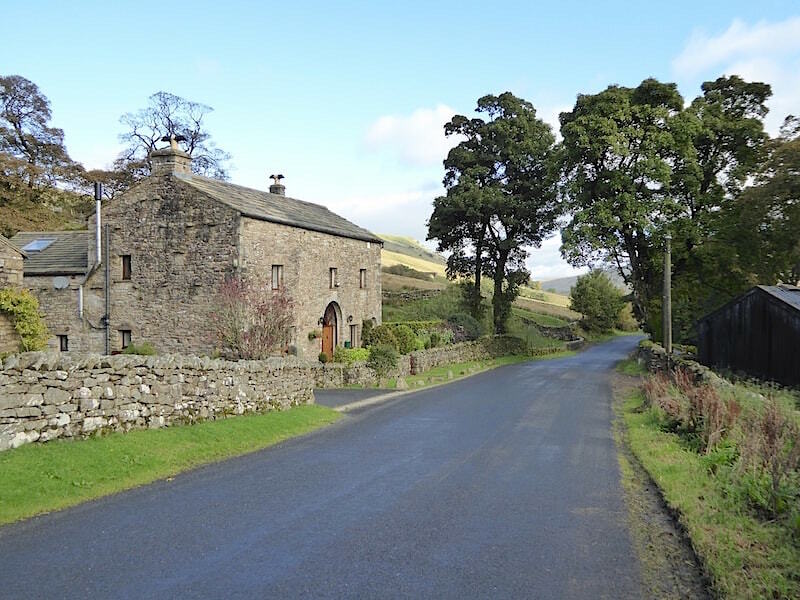 The car parking area is on the south side of Cotegill Bridge on the B6259 which runs from The Moorcock Inn (we can vouch for the good food and walkers are welcome) up to Kirkby Stephen. The parking area will accommodate about six or seven sensibly parked cars and behind me, just a little further along the road, there are a couple more roadside spaces its possible to squeeze into. There was no-one here when we arrived so we didn’t have to squeeze in anywhere for once. 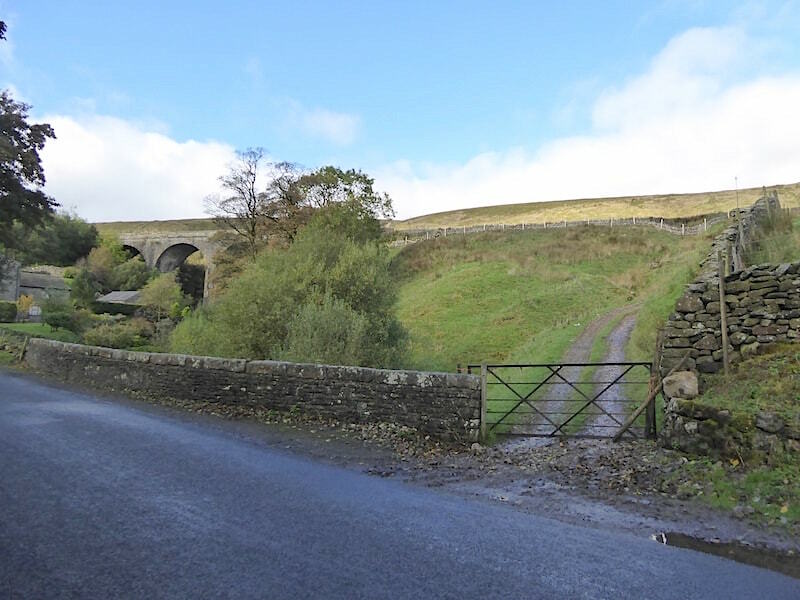 The bridge spans the Settle to Carlisle railway line and from here we cross it and head northwards along the road towards Aisgill Farm. 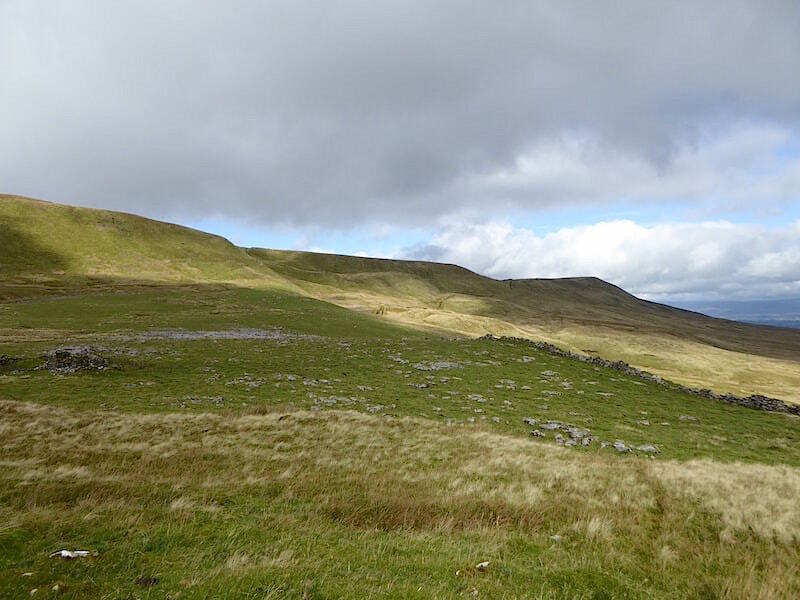 Immediately opposite the parking area is where we are walking today, Wild Boar Fell. A band of heavy rain made its way from west to east across the country last night, only clearing away from here around dawn so everything is still very much on the damp side. 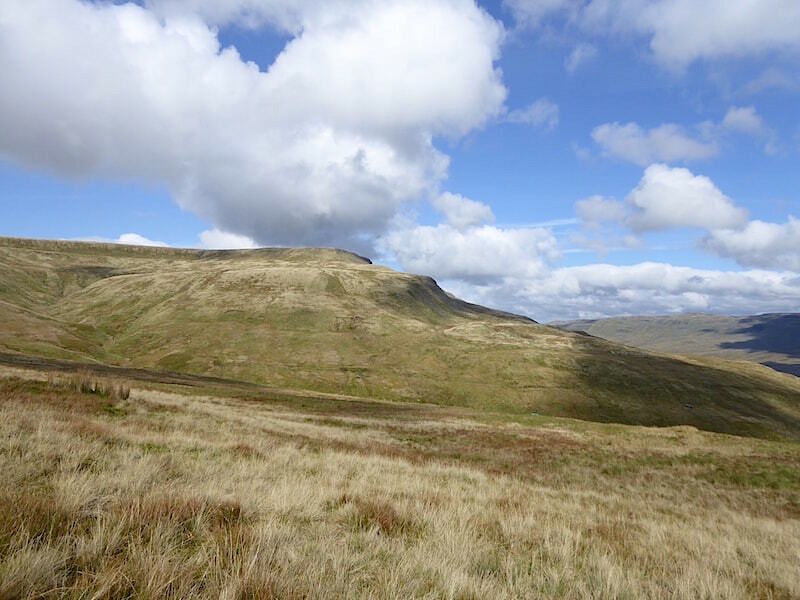 Another view of Wild Boar Fell as we walk down the road towards Aisgill Farm. Its a beautiful morning and the road is beginning to dry out under the warm sun. Still some cloud around but its high enough and, if the day warms up enough, it may dissipate altogether. Its not a long walk from the car park and we soon reach the farm, which is to the right of the shot, and this renovated building on the left. Just beyond the house is a low wall at the end of which is a gate and the start of the route we will be taking today. The low wall is a bridge parapet, the bridge spans Ais Gill which continues flowing down to the right where it eventually adds its own contribution to the River Eden in the bottom of the valley. Here’s the gate we are looking for, very rickety and attached to the post with baler twine, while a loop of baler twine serves as a fastening. 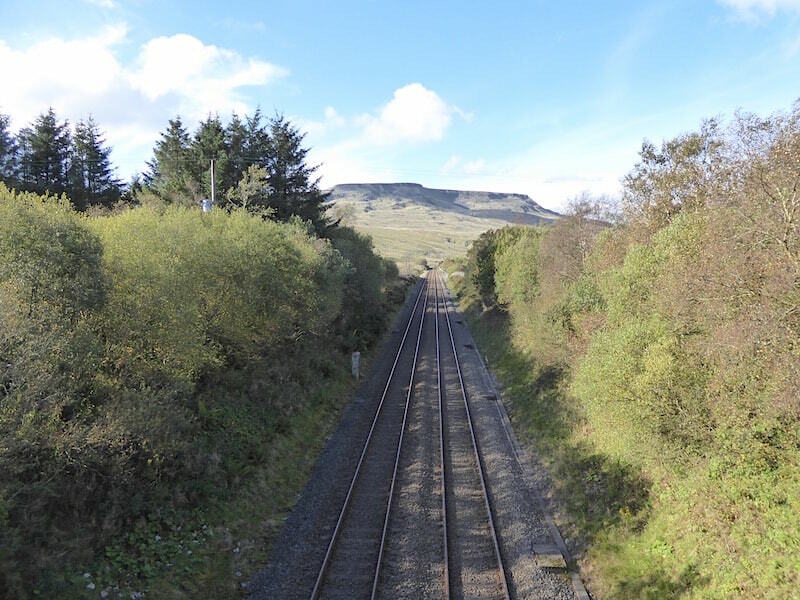 The track heading up the incline marks the start of our route. Debris piled around the gate was probably washed down in the rain. At the top of the incline the track veers left below the fence line and heads towards the railway viaduct which is situated behind, and very close to, the renovated house. 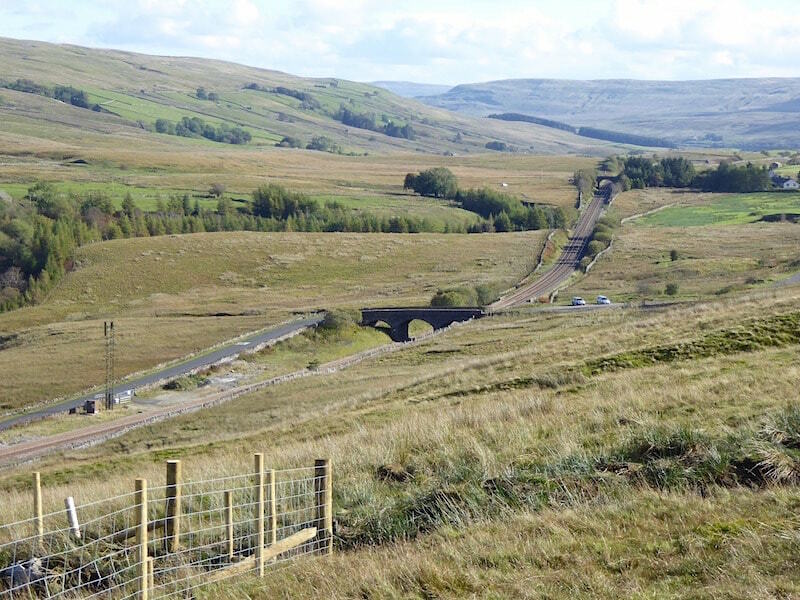 The occupants of the house will have a grandstand view of all the various steam locomotive events which take place along the line from time to time. 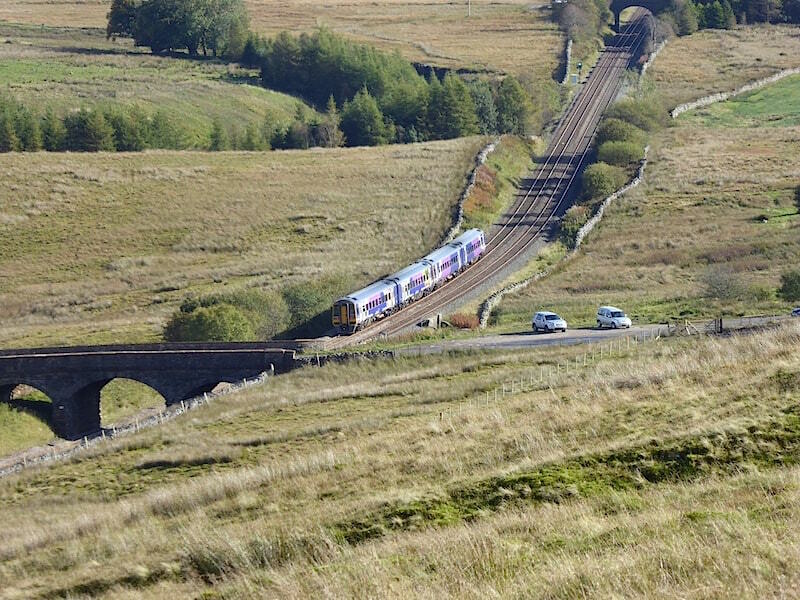 They will also have to put up with the everyday rail traffic too though because the line forms part of the UK rail network with trains using it seven days a week all year round. Maybe the owners are train enthusiasts. 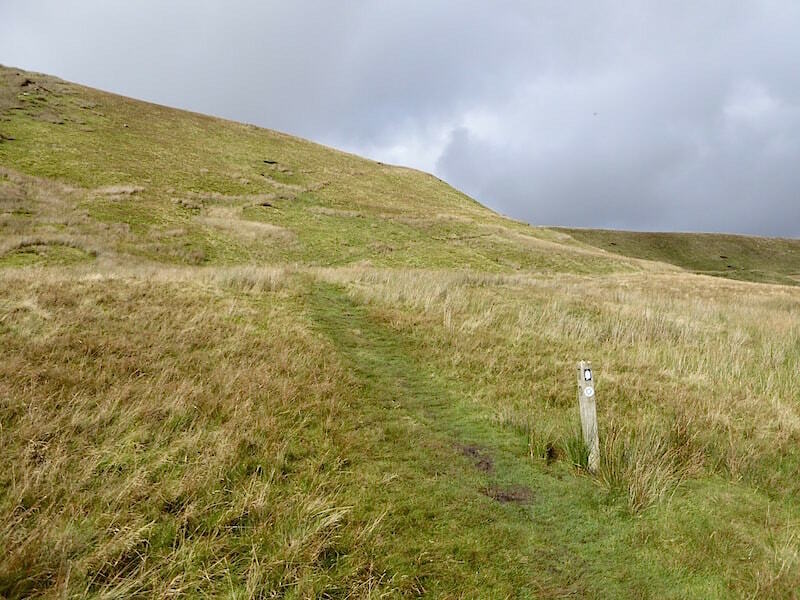 The path up the incline started wet and muddy and …..
….. got wetter and muddier the further up it we went. The farm vehicles using it have made deep, and by now sludgy, ruts in the ground and the grassy areas were very soft and soupy, so whichever we opted for we were very soon mud spattered and we’ve only just got started. On the plus side there was a fine waterfall roaring down the gill on the left hand side although I wasn’t able to get a good shot of it so I can’t show it to you. 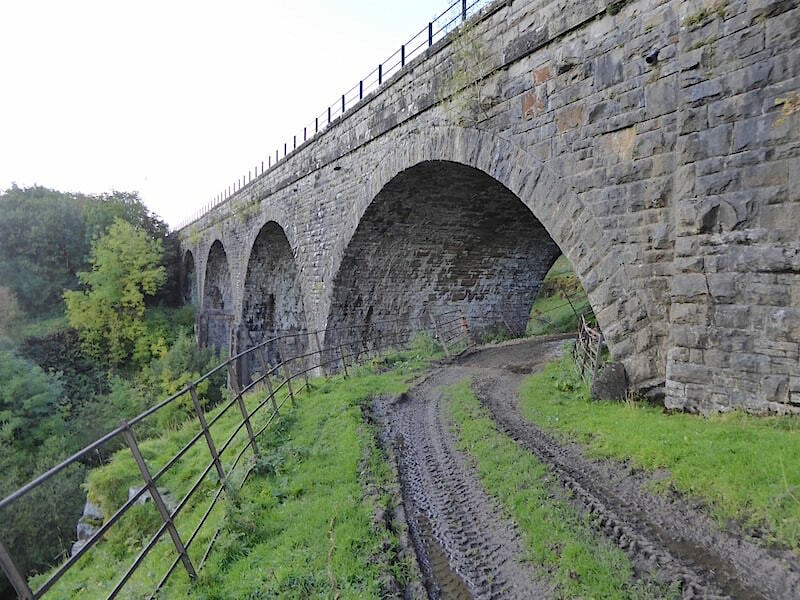 We turned right after walking under the viaduct and the path continued up another incline where the ground was even wetter and more churned up by the wheels of farm vehicles. It was slow going, not only because of the steep and slippery grass but because it would take a while to find somewhere reasonably firm where you could place your next step. I was starting to think dark thoughts but persevered, having persuaded myself that it would begin to get drier the higher up we went. 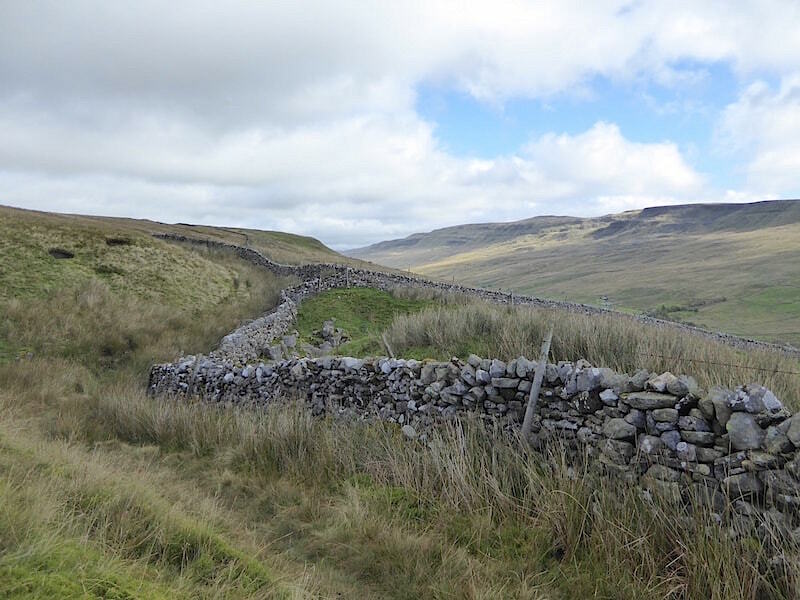 It didn’t get much drier as we followed the wall across the flanks of Wild Boar Fell but at least it wasn’t quite as wet as it was to begin with so we could at least begin to progress more quickly than we had been doing at the start. The path alongside the wall may look dry but every step along it produced the all too familiar sound of the slurpy, sucking squelch beneath our boots which has accompanied us on too many of our walks this year. 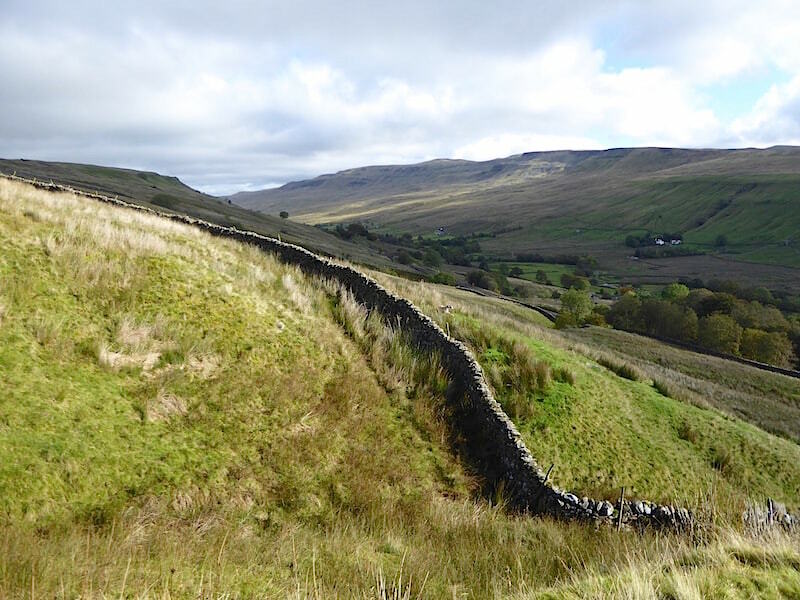 The wall continues along the flanks and heads on to the flattish area of High Bank on the left skyline. 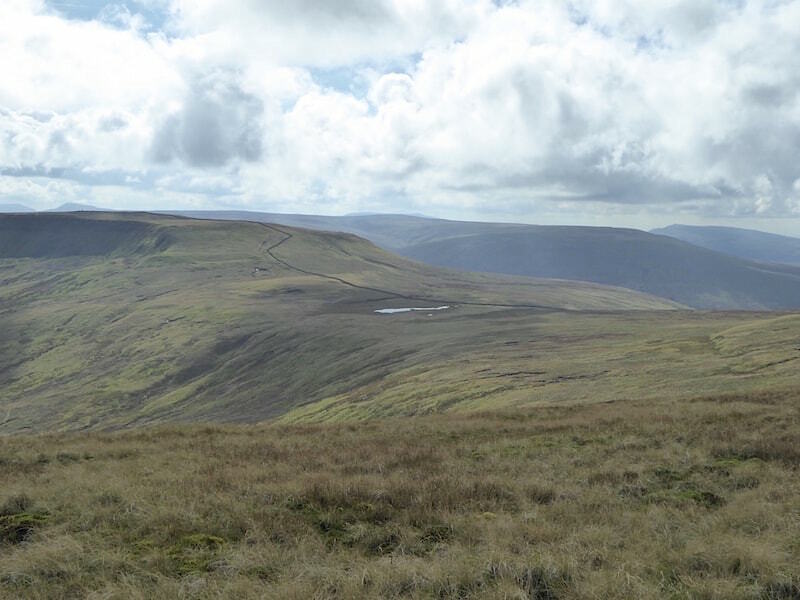 Behind us on the left skyline is Swarth Fell Pike and to the right of it is the mile long summit plateau of Swarth Fell. 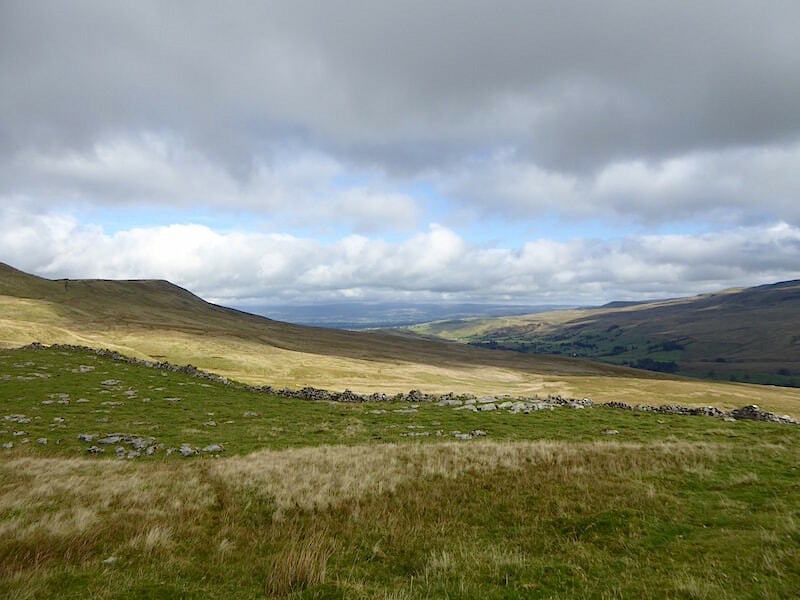 Looking south over a sunlit Mallerstang Valley from the pathway. 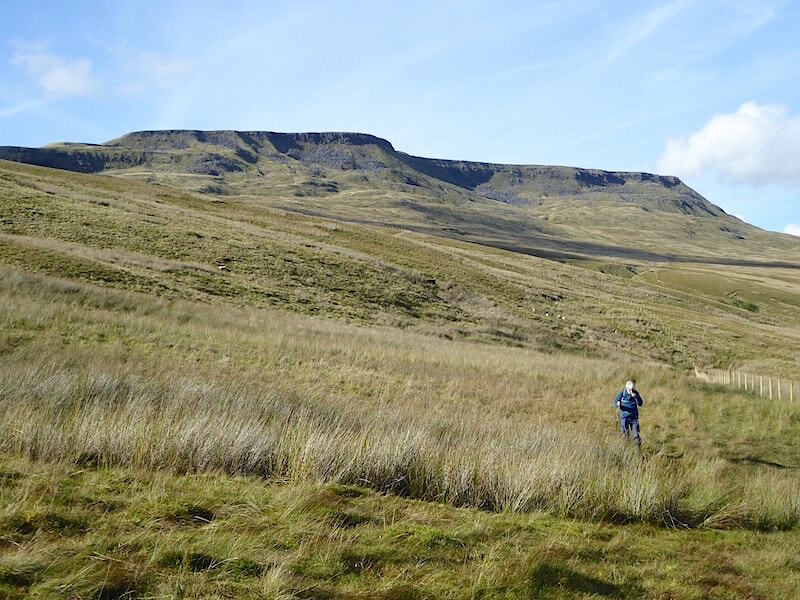 Ever changing but constantly in view on our left is the summit plateau of Wild Boar Fell. 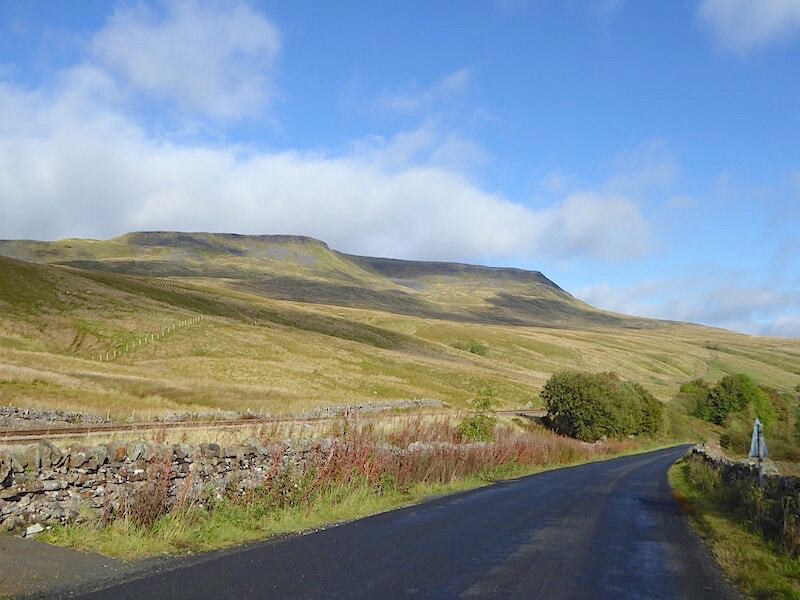 There’s a very dramatic view of it when driving down Mallerstang from the Kirkby Stephen side where the peak of The Nab, in this shot over on the right, is all that is visible and there is no hint of its true appearance. 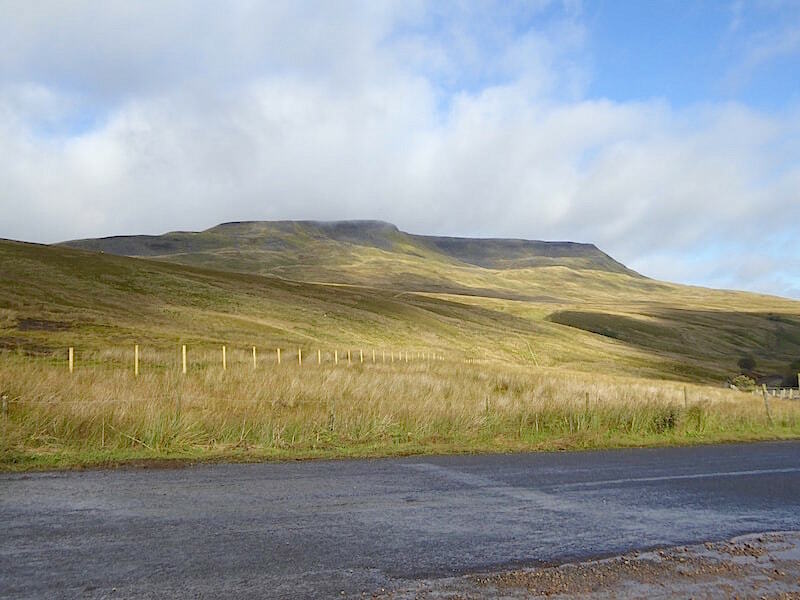 From this viewpoint it looks similar in appearance to Ingleborough but that’s some twenty odd miles away to the south in the Yorkshire Dales. 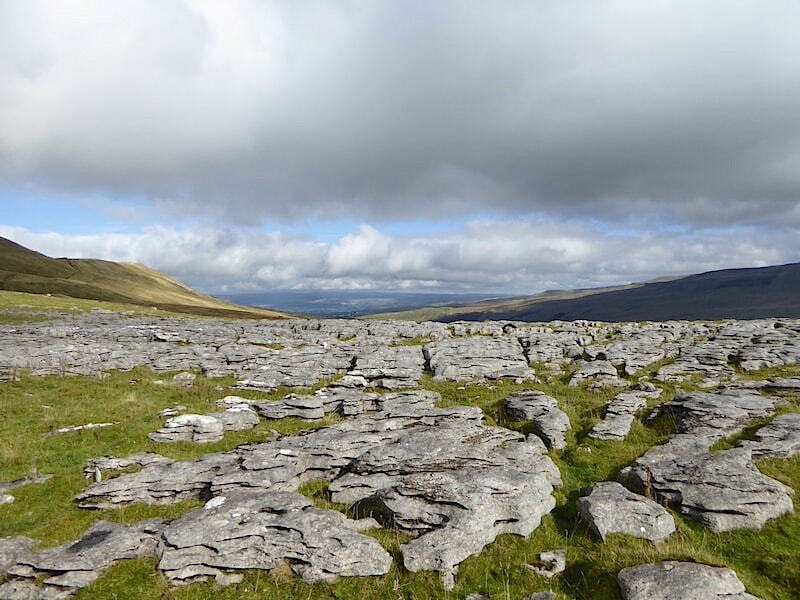 On dry ground at last and another look back at Swarth Fell as we cross the lumpy and grass covered limestone pavement above High Bank on Mallerstang Common. 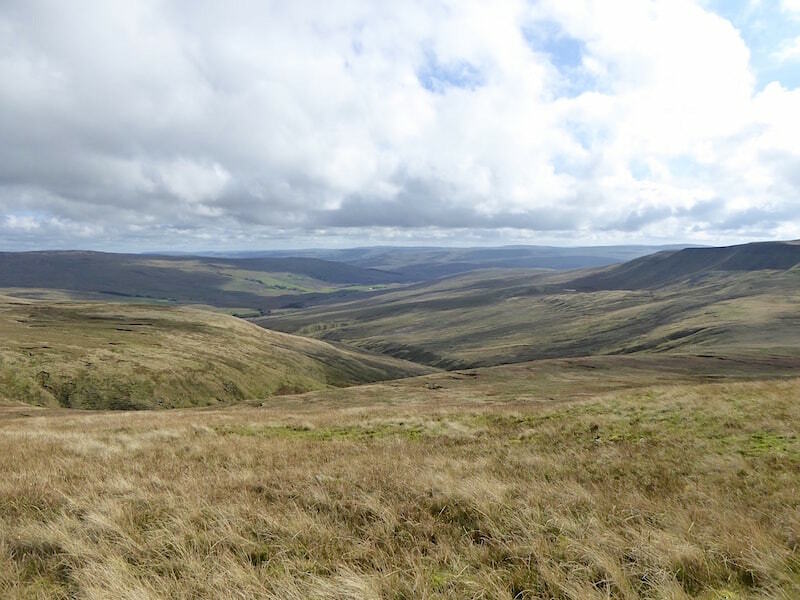 As we crossed we saw numerous fenced off areas preventing the unwary, be they human or ovine, from falling into the many shake holes and pot holes which are to be found up here. 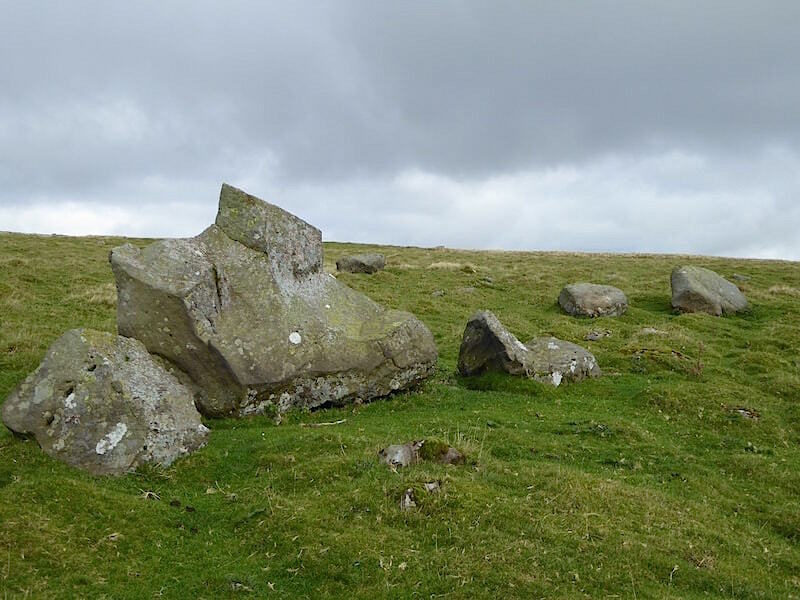 This isolated group of boulders caught our eye and we wondered if they were erratics or …..
….. whether they were lumps of millstone grit which had tumbled down from the rocky cliffs of Wild Boar. Where’s Dr. Iain Stewart when you need him? We do know what this is though and we do a fair imitation of rockhopper penguins as we make our way across. It wasn’t strictly necessary as it wasn’t a huge area of pavement and could have been skirted around very easily but as it just begs to be walked over you really can’t ignore it, can you? 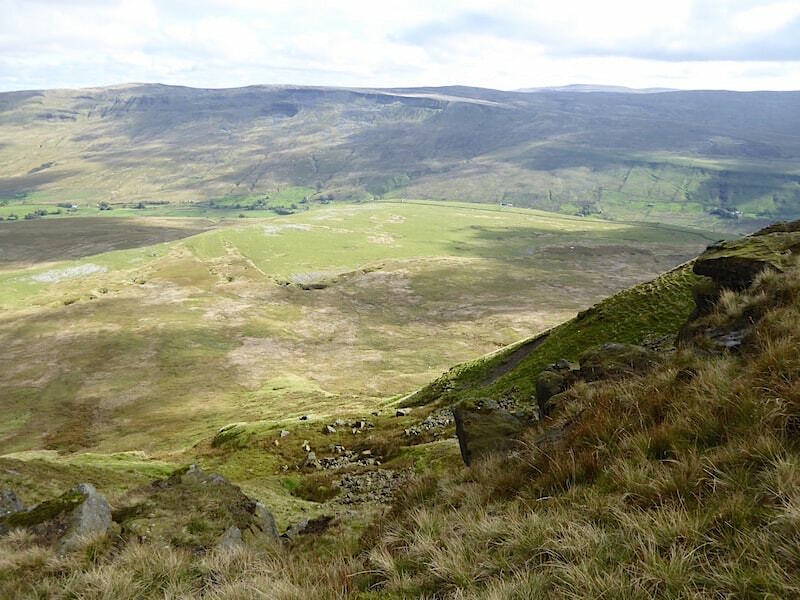 We reach the end of the flattish ground above High Bank and now have a view of Wild Boar’s near neighbours to the north, Little Fell in the centre with Greenlaw Rigg just beyond it. 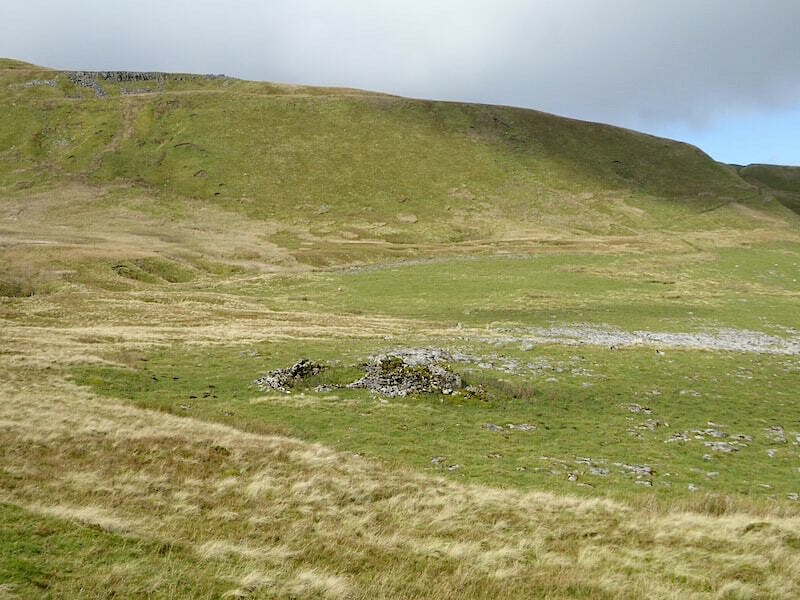 To the left of the shot is the north ridge of Wild Boar Fell leading up to the subsidiary peak of The Nab. That’s where we are heading and the binoculars come out here to spot the waymark posts which indicate the location of the Pennine Bridleway coming up from Hazelgill down in the valley. 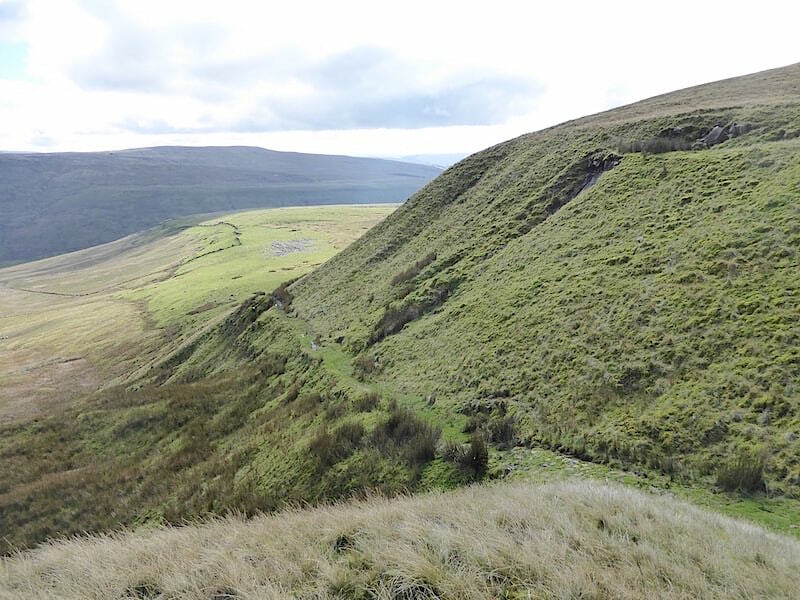 It wasn’t really necessary though as we could quite clearly see the path traversing the fell side below the left skyline. If you zoom in you’ll probably be able to pick it out too. Rough, rugged and remote it may be but it wasn’t totally devoid of activity. Off to the right a couple of farmers already had winter on their minds and were out on the fell side some way below us putting out plastic wrapped silage bales at various points in readiness for the sheep’s winter feed. The silage bales were stacked on the back of a huge machine fitted with caterpillar tracks instead of wheels and which made light work of crossing the sodden slopes. The machine looked as if it had been adapted for its present purpose from a mish-mash of other vehicles, it definitely wasn’t something that was commercially available. 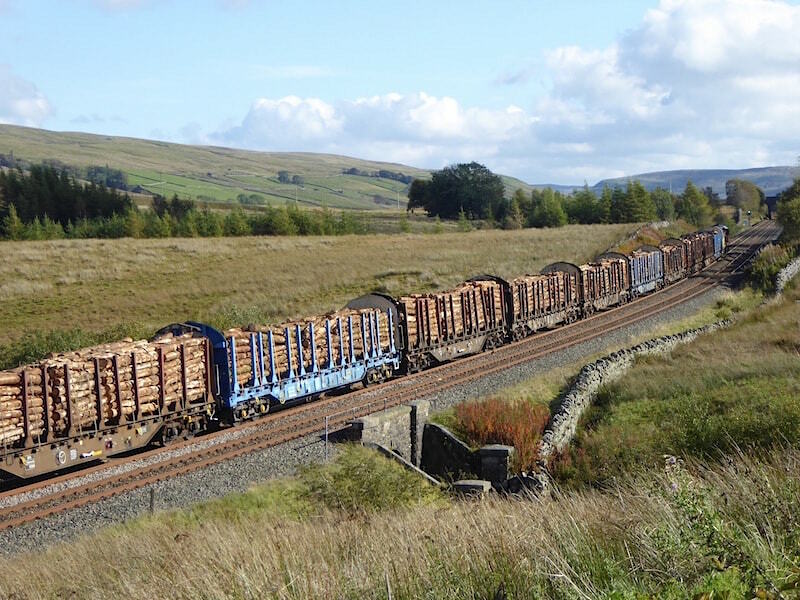 Every so often they would stop, unload four or five bales and then move on to the next point and repeat the process. A bit of forward thinking that will save a lot of work when the grass stops growing and the snow eventually covers the ground. 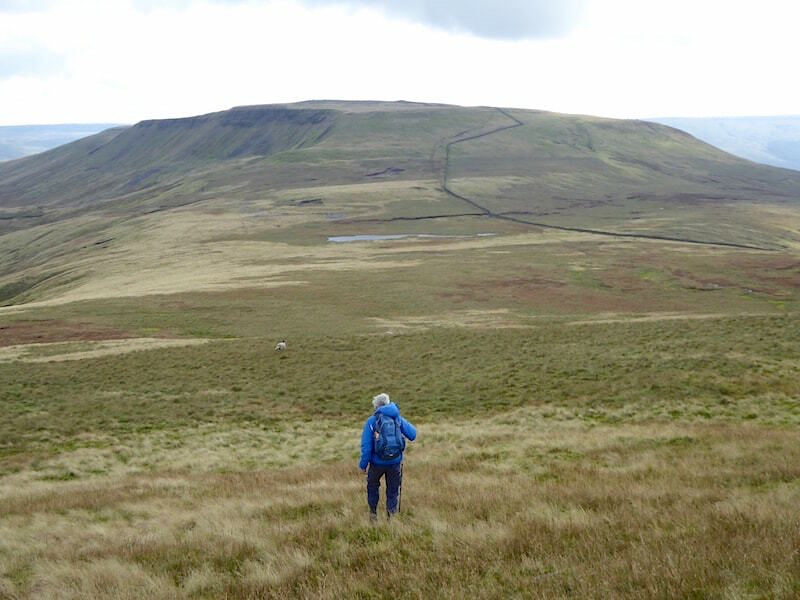 We dropped down from High Bank and made our way over to the bridleway, on our left is the peak of The Nab. Although the name doesn’t appear on our route map, on the OS map this area bears the name of Little Wold. Apparently wold was the Old English word for forest but any traces of forest which may have been up here are long gone. 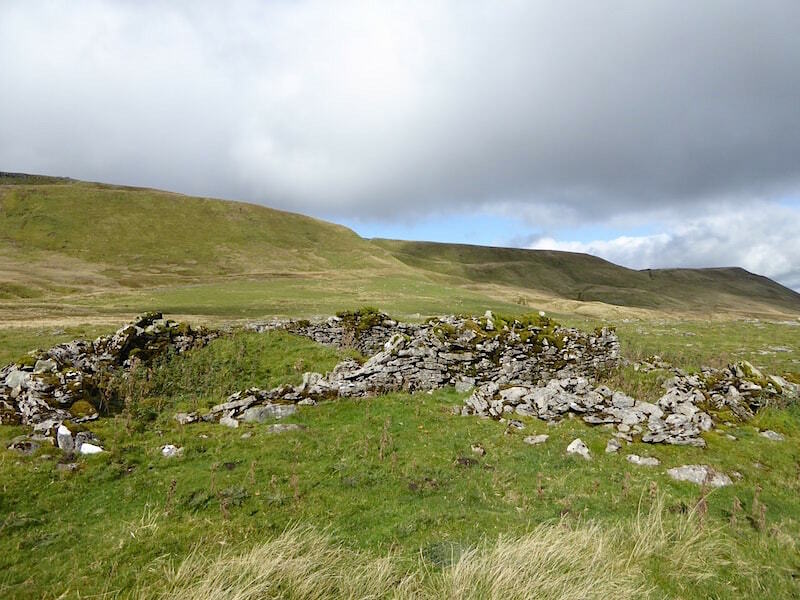 A derelict building remains though …..
….. but we couldn’t work out its original purpose. 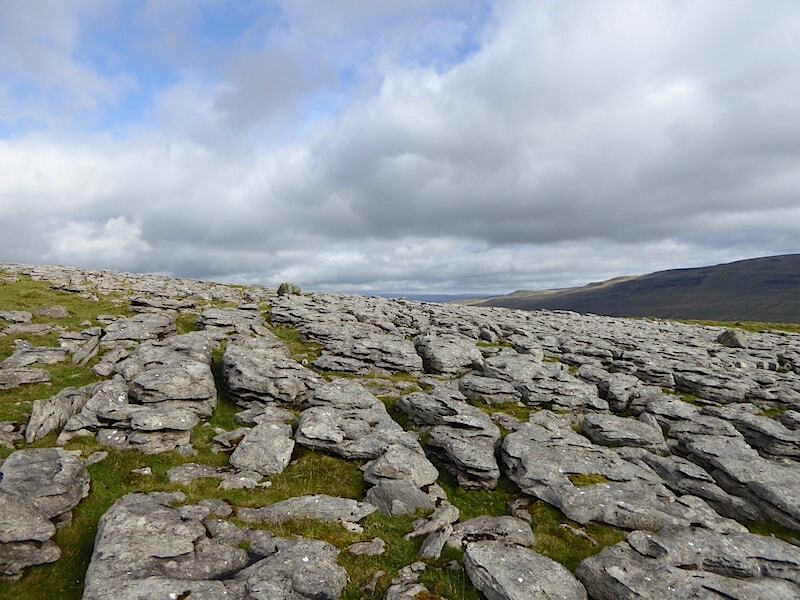 Beyond the derelict building was another area of limestone pavement but we refrained from any more rockhopping and skirted around it en route for the bridleway. A look back to the pavement with the derelict building just beyond it. 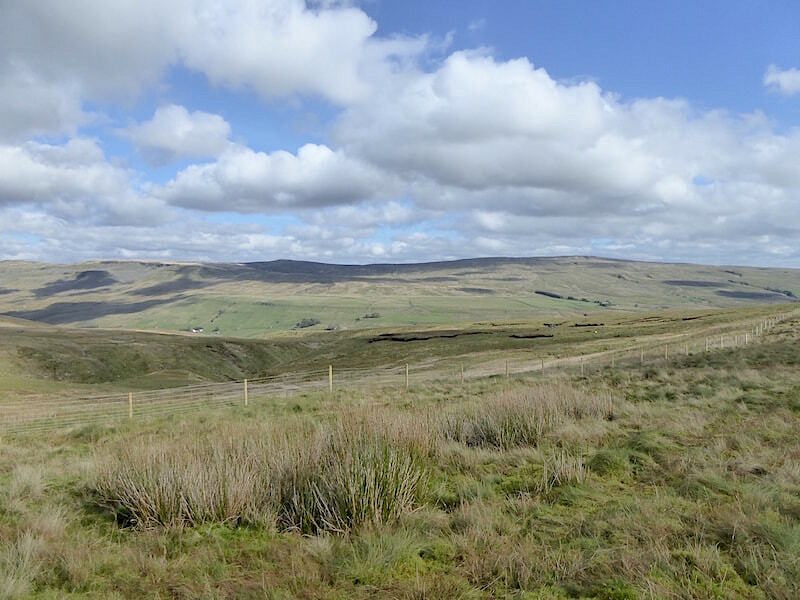 In the distance the moorlands of the Yorkshire Dales National Park are beginning to put in an appearance. 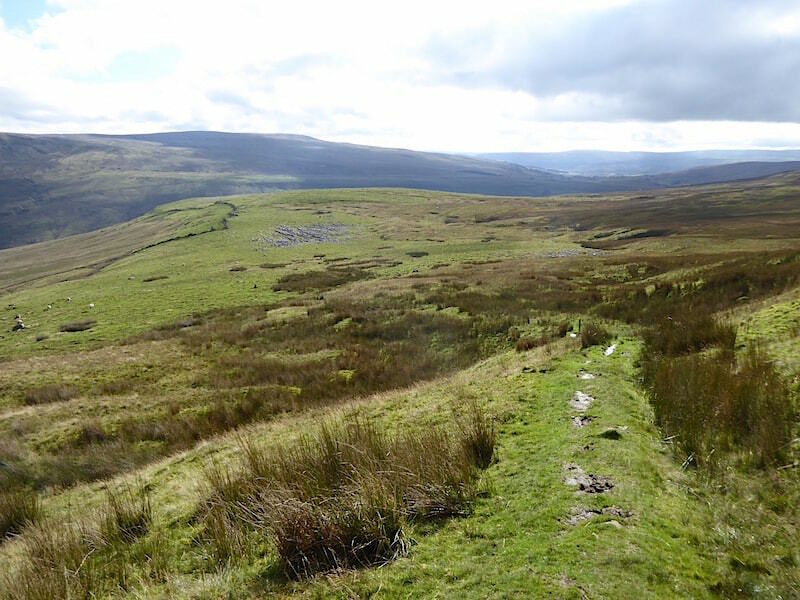 Joining the Pennine Bridleway, now its time to start climbing again. The path is soggy but its not the quagmire that some previous sections of our route have been. 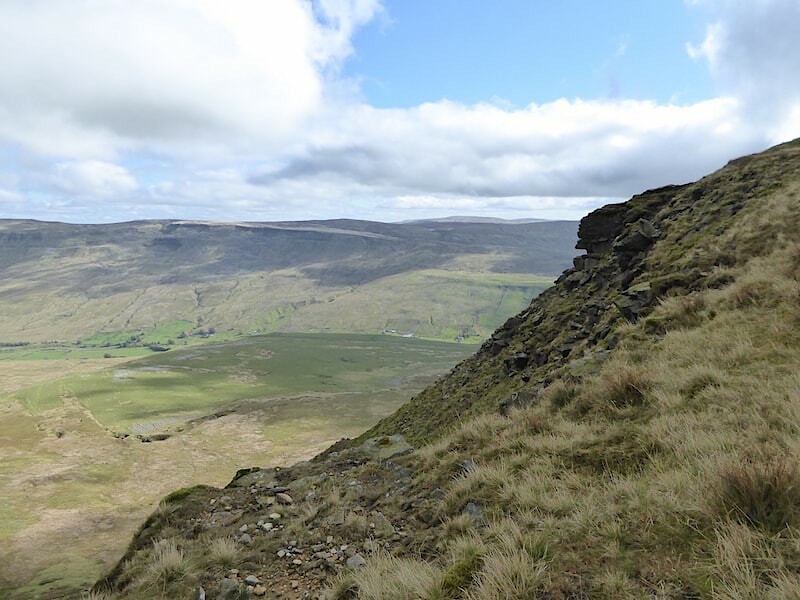 From the bridleway a look back at Mallerstang Edge across the valley and peeping up above the escarpment is High Seat, at 2326′ its the fourth highest fell in the Yorkshire Dales. 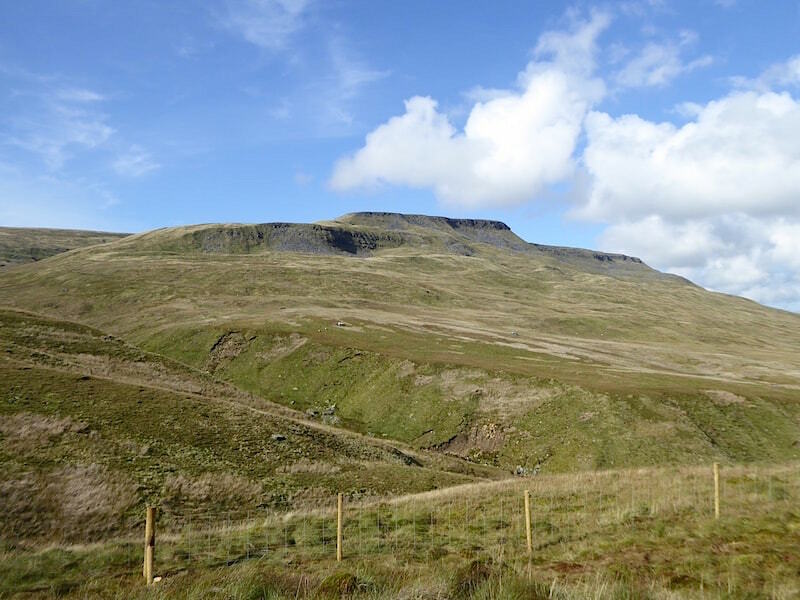 The county boundary between Cumbria and Yorkshire lies above Mallerstang Edge and slightly to the west of High Seat’s summit, so Cumbria gets Wild Boar Fell and Mallerstang Edge while Yorkshire hangs on to High Seat. 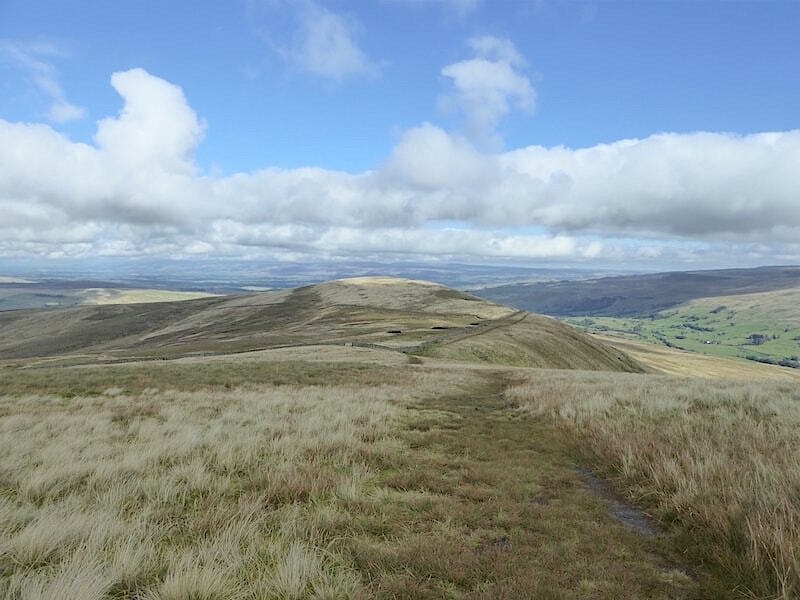 We had a view of the other side of High Seat when we walked up to Nine Standards Rigg back in May. Looking back down the bridleway which at this particular point felt like walking over an inverted letter u. Being raised a little along the central section it had the advantage of being dry if a little awkward to walk along. We’ve reached the point marked on the map as High Dolphinsty, yet another example of one of those wonderful intriguing place names, so we stop for a look back. The bridleway coming up from Hazelgill is going off to the left of the shot, and the route we followed came across High Bank where the limestone pavement can be seen. 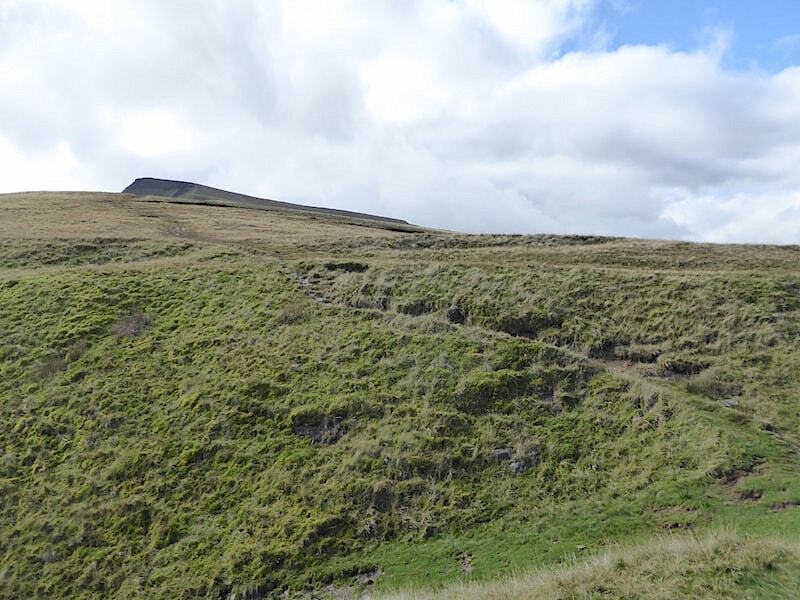 High Dolphinsty marks the point at which we turn off to the left to continue on up to The Nab and the summit plateau of Wild Boar Fell. 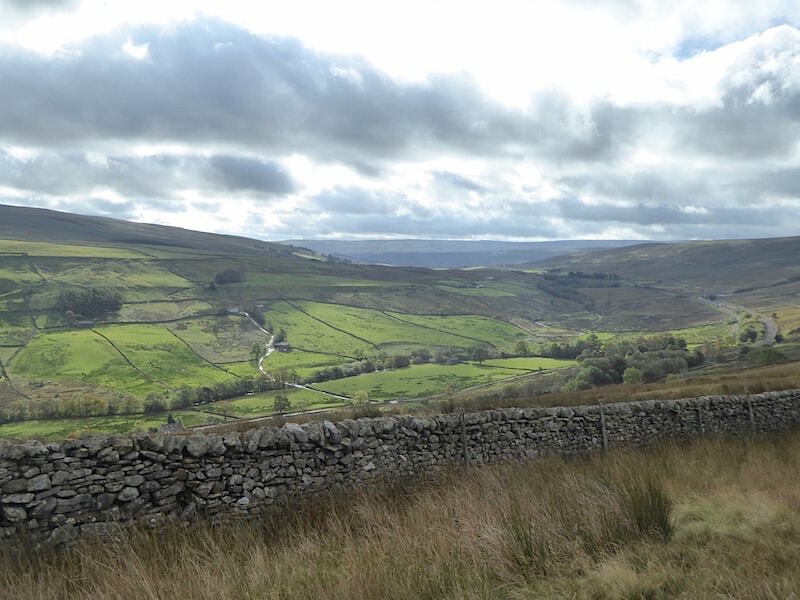 Behind me is a wall which from this point continues on down the fell side and into the Ravenstonedale valley. 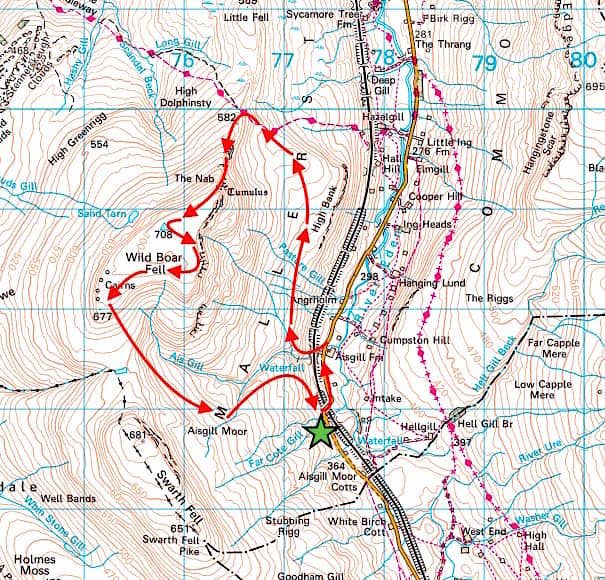 From here up to The Nab we have about another 500′ of climbing to do so I suppose we’d better get on with it. 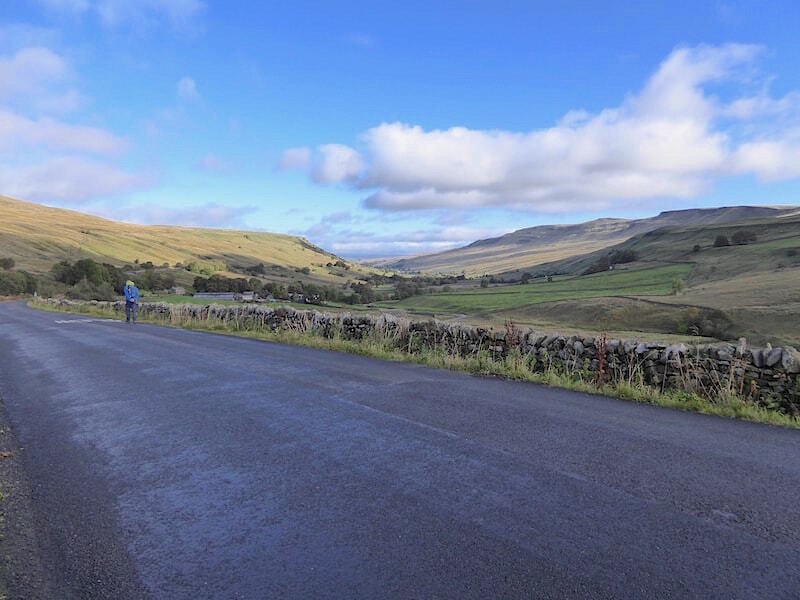 The gradient isn’t too bad, being one of those which climb steadily over a distance rather than being of the short and steep variety, but eventually we stop to give the legs a rest and allow the lactic levels to fall. Below us is the wall from where we turned to begin the climb up to here. 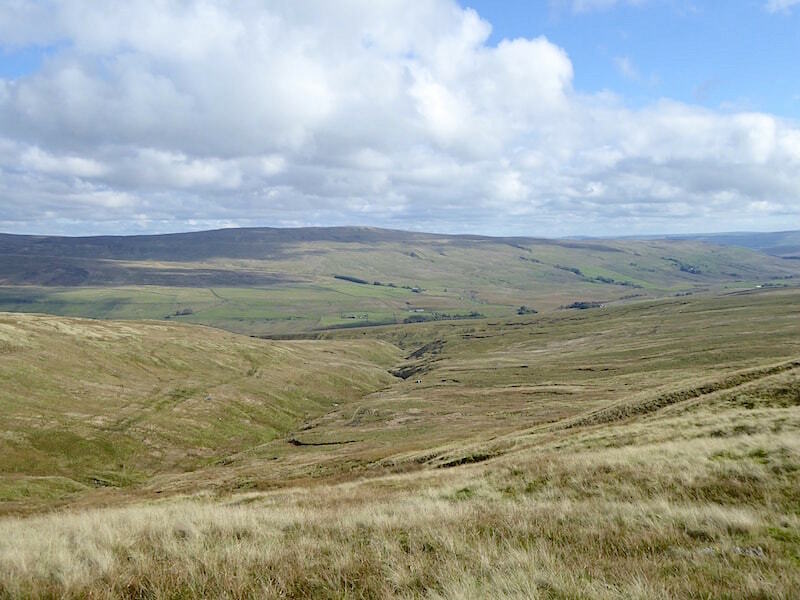 Little Fell is on the other side of the wall with the Northern Pennines stretching across the distant horizon. As you can see the path has turned squelchy again. From the same spot I turned around for this shot of the way ahead. 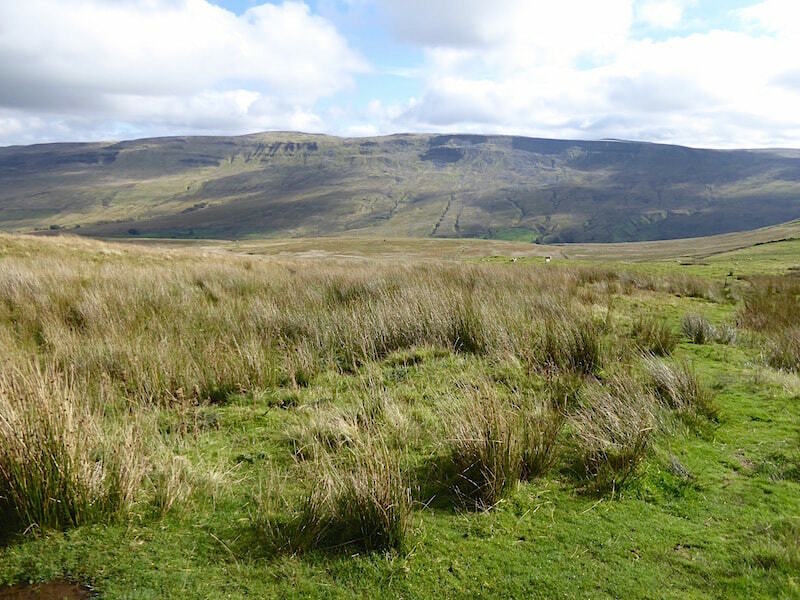 In addition to the peak of The Nab we are now beginning to see the extensive summit plateau of Wild Boar Fell over to the right. 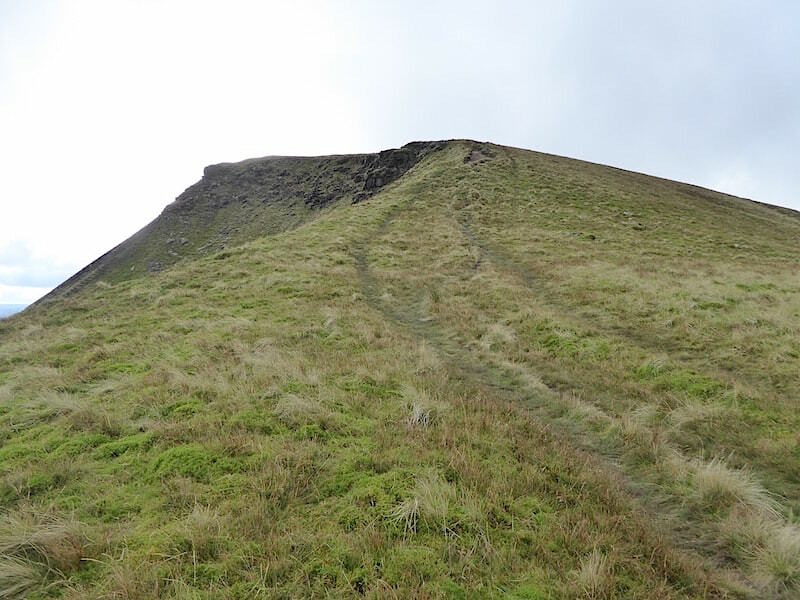 The climb changes character and goes from a reasonably gentle gradient to a rather more stiffish one. Our usual procedure comes into play, pick a point, get to it, rest the legs for a minute or so, and then repeat as often as necessary. Looking back on a sight to take your breath away, although it had already been mostly taken away by the climb up here. 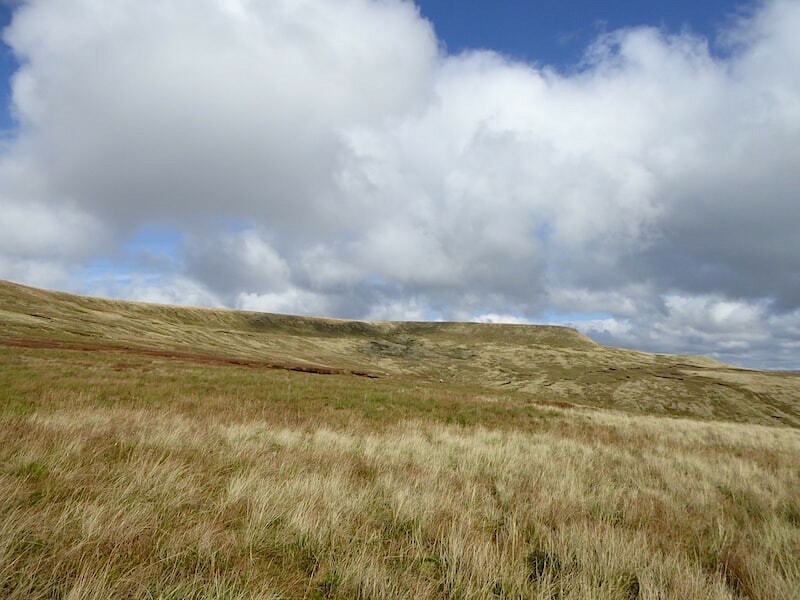 The sun lighting up the blond moorland grasses as they rippled in the wind, and the drifting clouds casting swiftly changing shadows across every hill and vale. Its fascinating to watch the elements create a living painting right in front of you. 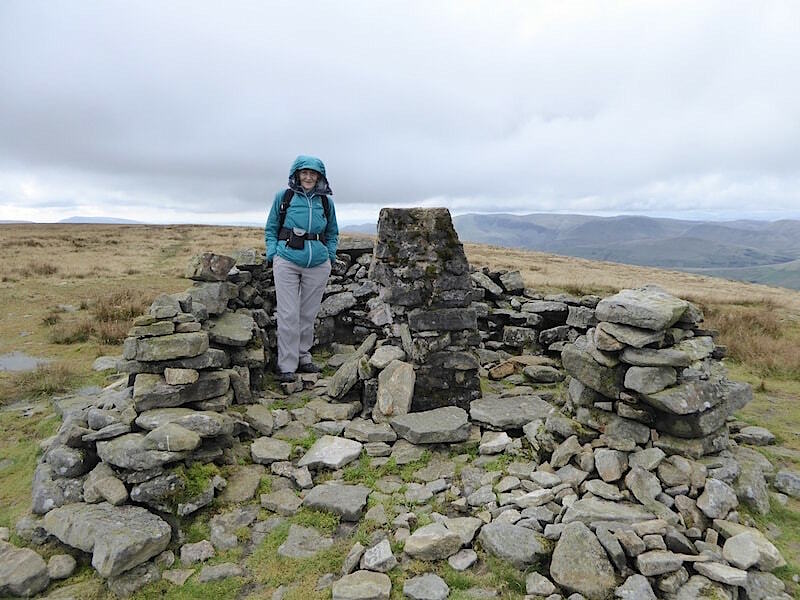 On we go with less than 100′ to climb now …..
….. and from the path above the crags we can look down to High Bank and the various limestone pavements scattered across it …..
….. while straight ahead the gritstone cliffs forming Wild Boar’s escarpment are getting closer …..
….. and just a short distance beyond is the summit cairn marking the top of The Nab, to the east of which is the Mallerstang Valley, Mallerstang Edge and High Seat …..
….. and the view north eastwards to the Eden Valley and the North Pennines. 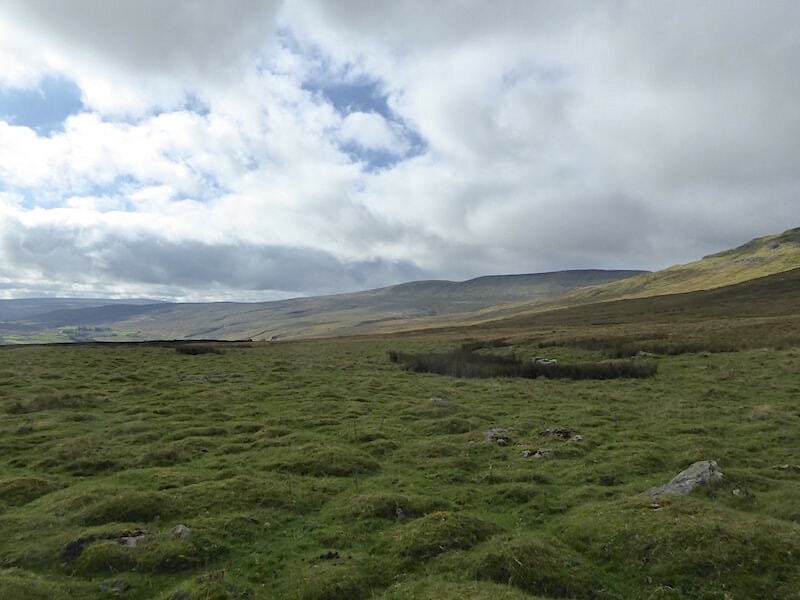 Behind me is the cairn while ahead is the extensive plateau of Wild Boar Fell and a choice of routes. 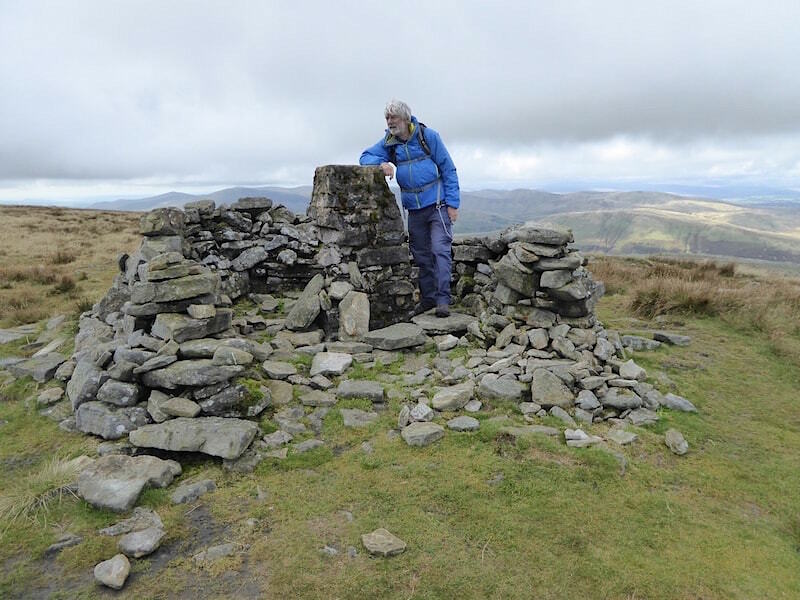 The left hand track follows the rim of the escarpment while the right hand one leads over to the summit trig point and its small shelter. Both paths were very wet, hardly surprising though given the amount of rain last night and there not being much of a slope to drain away the excess water. True to form we arrive on the plateau at the same time as a long band of cloud and a strengthening wind, jackets back on? Aye I think so, the wind is coming straight at us and its a good ten minutes or so over the waterlogged ground to the trig point. After a bit of a chat with a chap who was already at the shelter and who was just about to leave having finished his lunch break, we decided to do the same while we had a bit of shelter from the strong breeze. 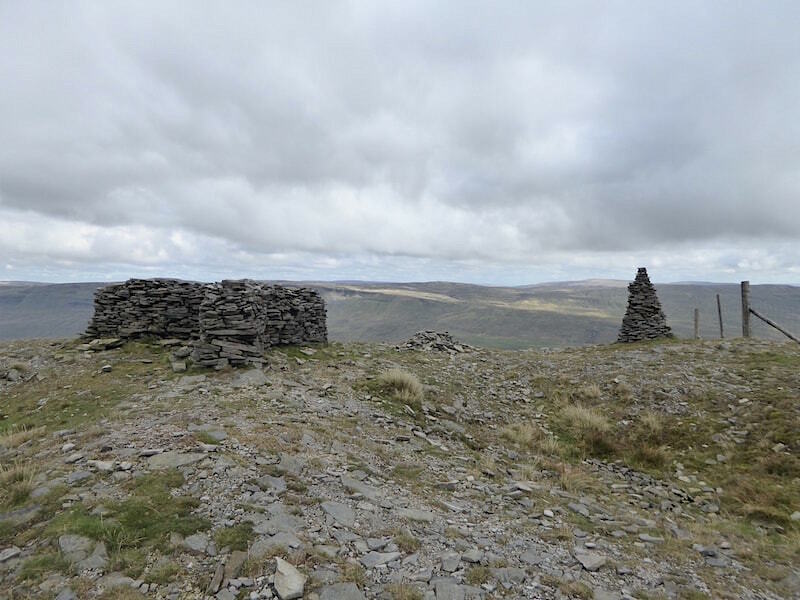 It became decidedly nippy in the breeze and under that mass of cloud, and the shelter didn’t provide much by way of cover, so it was a quick lunch stop. As usual I’m huddled into my jacket with my chilled hands stuffed in pockets, the gloves went on soon after. The trig point is in need of some attention as quite a lot of the eastern side of it has collapsed. There’s sunlight on The Howgills beyond so we’re hoping this band of cloud will be drifting away before much longer. 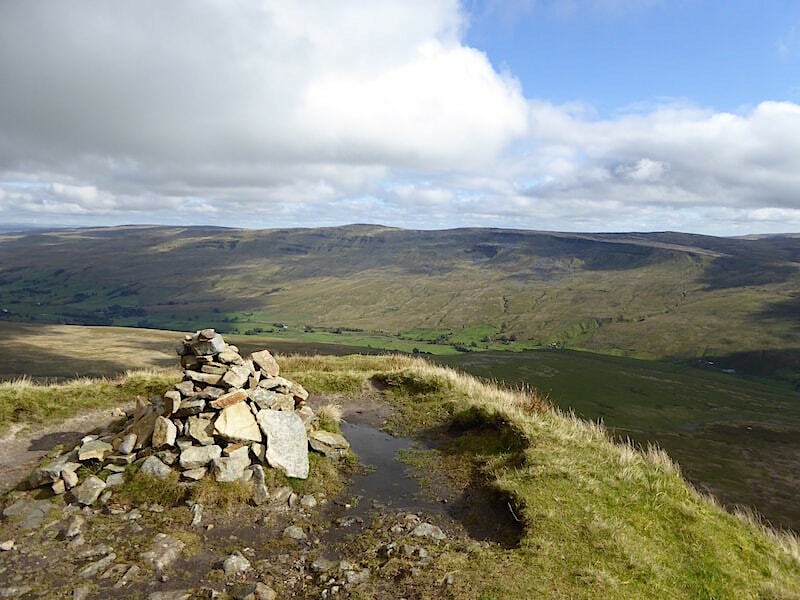 I forgot to walk the short distance beyond the trig point in the direction of the Howgills and take a shot looking down to Sand Tarn which lies just below the summit plateau on the western side of Wild Boar. It was quite chilly at this point so I must have been more concerned with getting a move on and getting warm again to remember about the tarn. 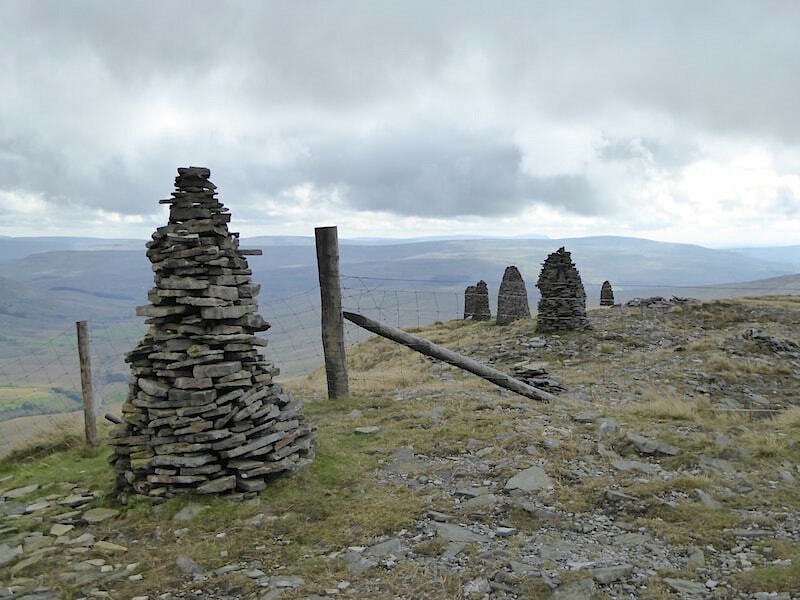 From the trig point we head due east over to the rim of the escarpment where there is a more substantial Y shaped shelter together with one of the many stone ‘standards’ which have been placed along the rim. 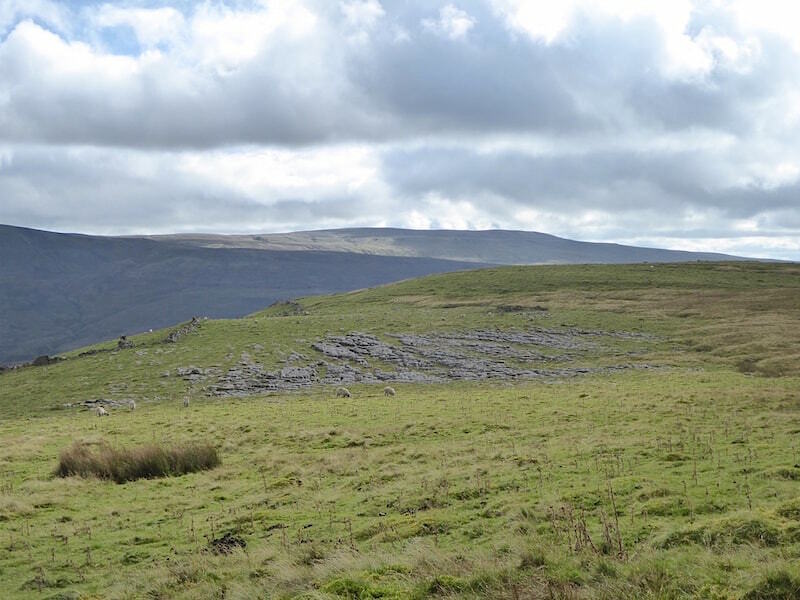 Looking south along the escarpment rim of Yoadcomb Scar where more of the ‘standards’ or ‘stone men’ are situated. The fence has a stile just off to the right so there’s no difficulty in accessing the ones beyond. I think I counted nine in total. 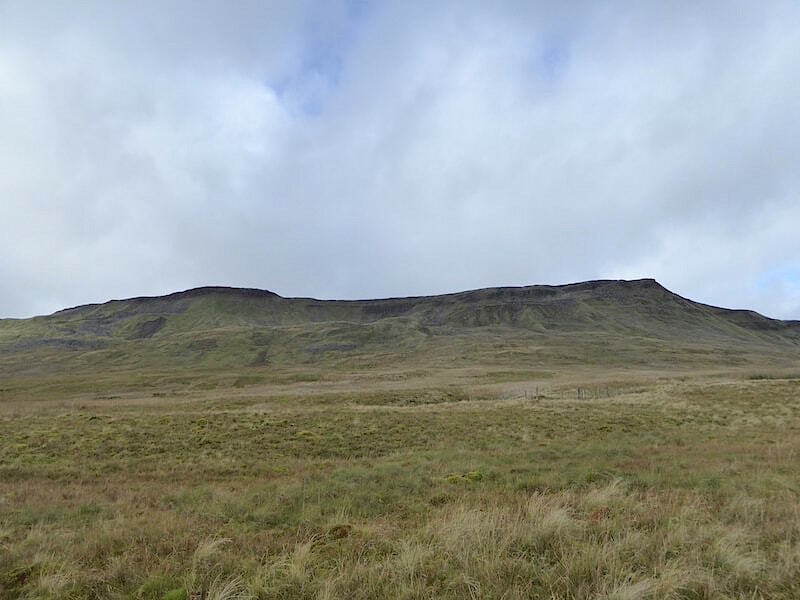 Looking northwards for this view of the escarpment and the summit plateau. 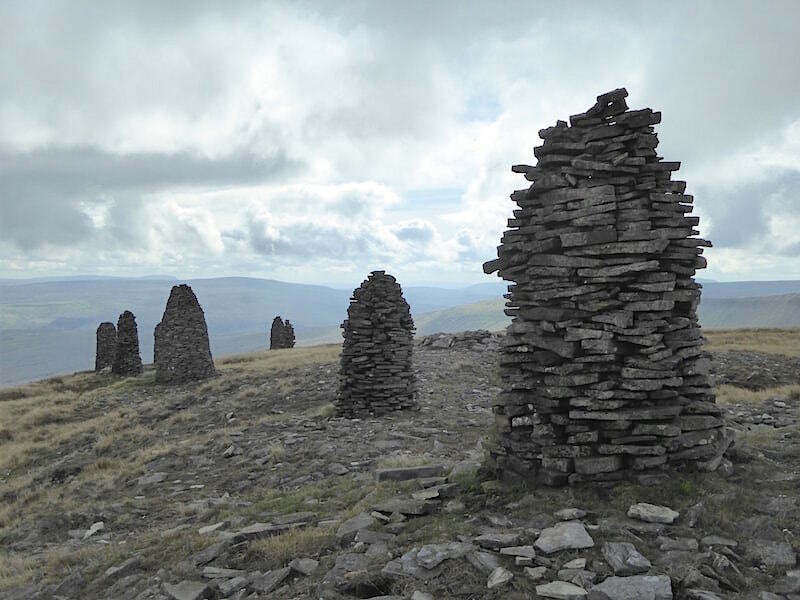 The ‘stone men’ are reminiscent of those on Nine Standards Rigg although they are much smaller. Most of them are in good condition but there were a few places where others might have stood but which are now nothing more than a mound of stones. 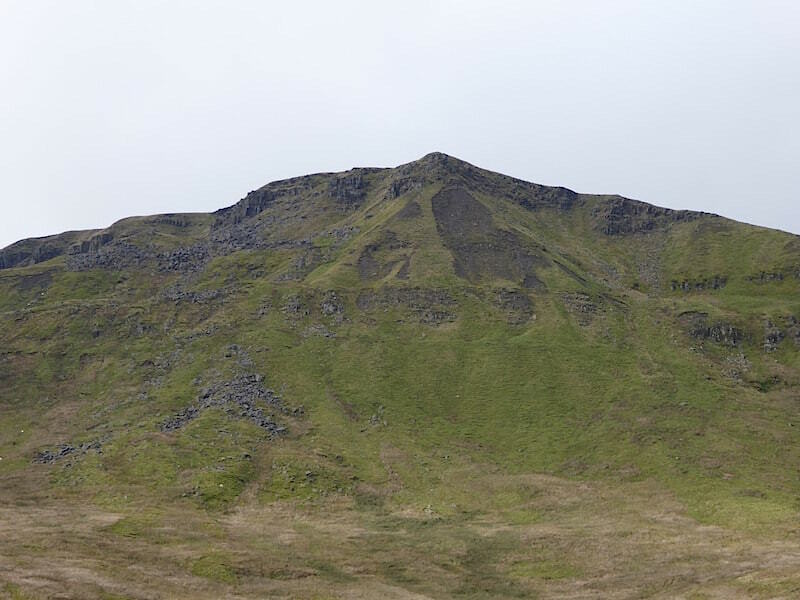 One such mound is visible in the photo between the first and second structure. 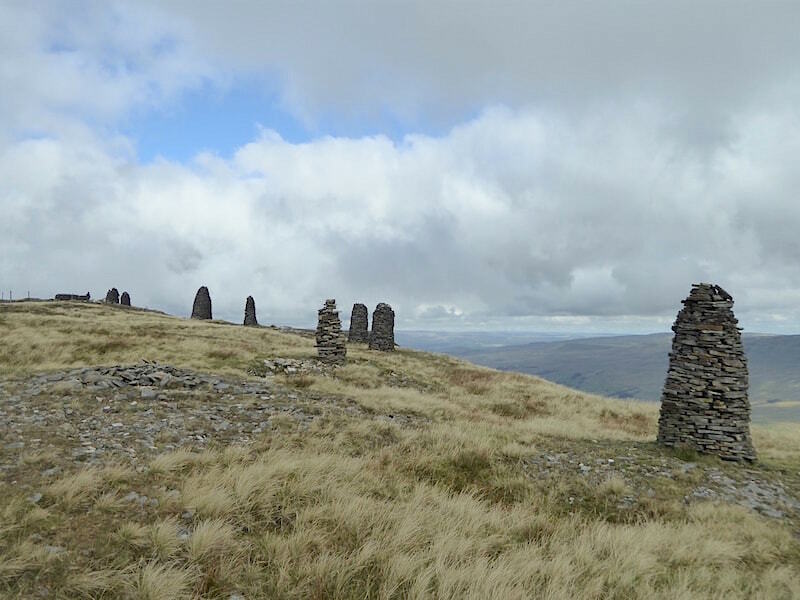 Who built them and why remains a mystery, but there are too many of them around on these higher hills for them not to have had some purpose or meaning. 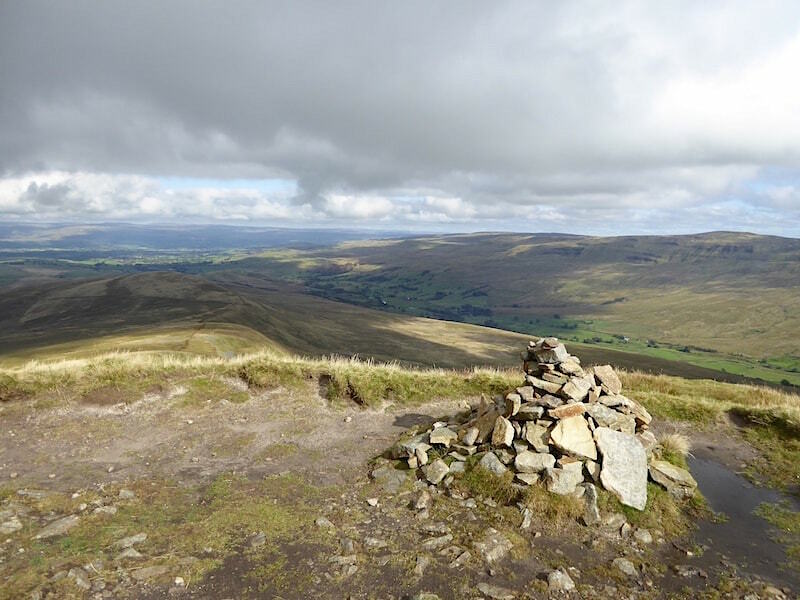 We walked along the rim to the last of the ‘stone men’ and then started working our way across towards the path over to Swarth Fell. 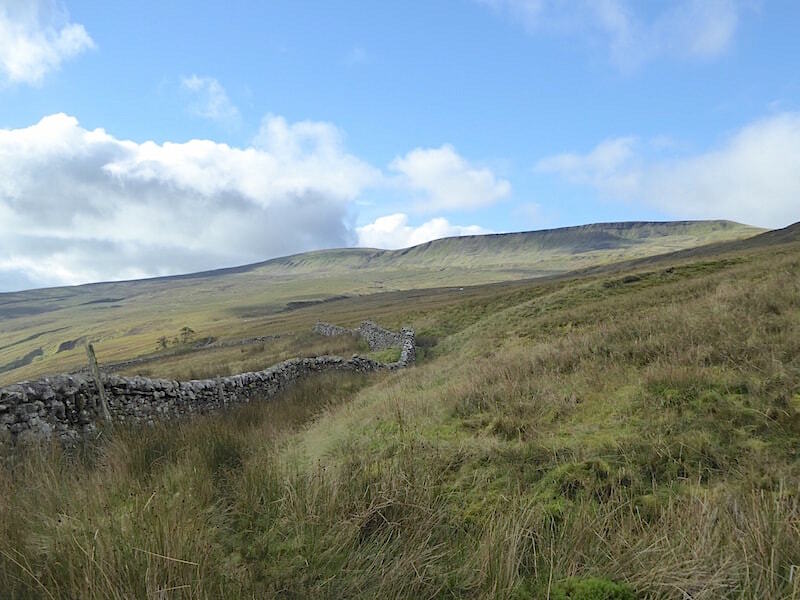 Ahead of us is the wall alongside which is the pathway over to Swarth Fell. 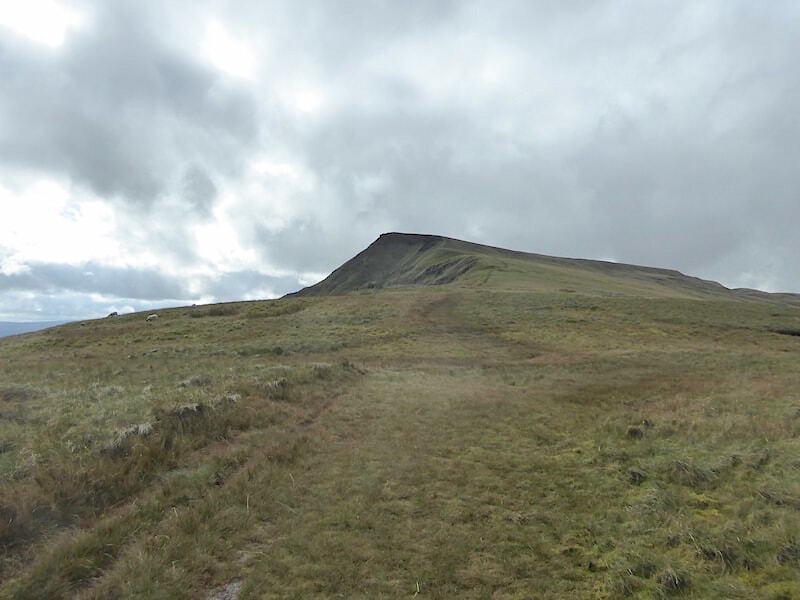 Although we’re heading in that direction we aren’t going to go up to Swarth Fell, instead we are intending to follow the path we are on until we are beyond Ais Gill and then take an off path route back to our start point. As we make our way over the band of cloud, which has been with us for well over an hour now, finally takes its leave of us and the sunlight burnishes the fell sides once again. 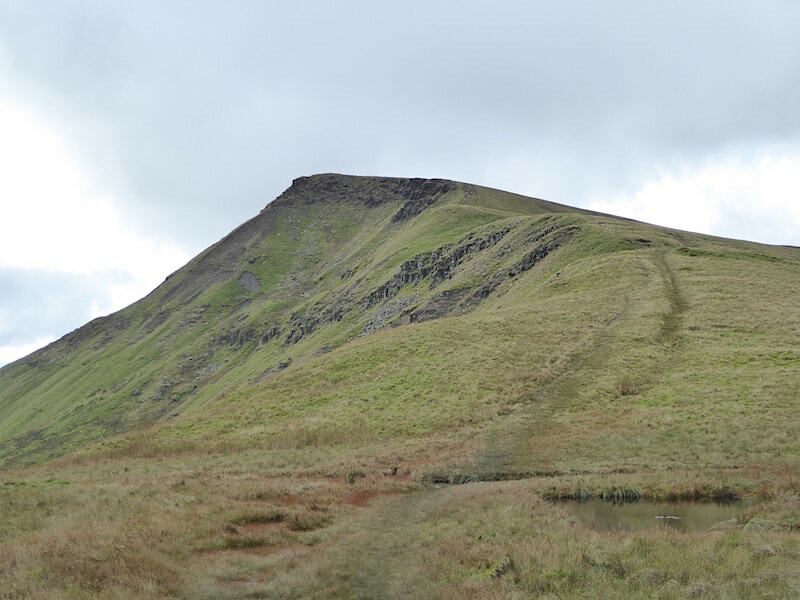 Immediately below us is the deep cleft of Ais Gill and once beyond it we will leave the path and begin to drop down the gentler slopes below the un-named tarn. 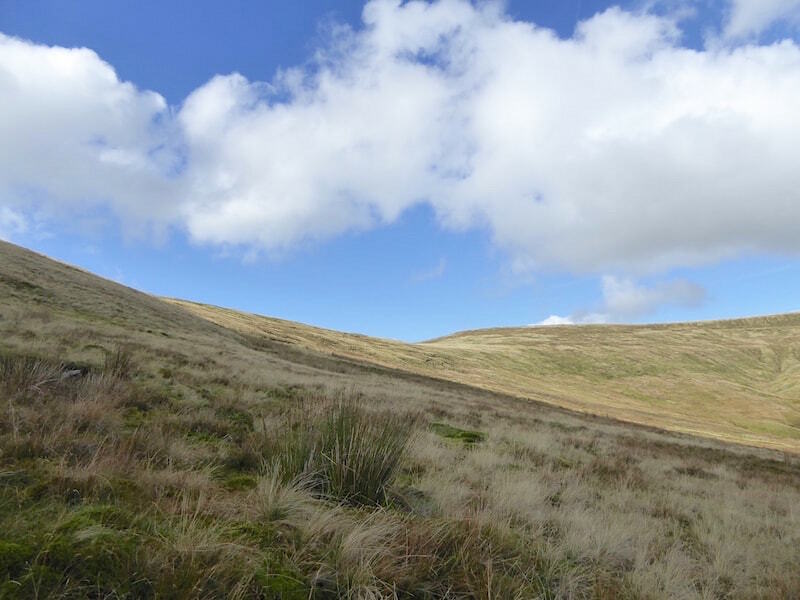 Its turning into a lovely afternoon as we begin to leave Wild Boar’s plateau and as we’re quite some way along the ‘stone men’ are no longer in view. Beyond Ais Gill now and we left the path around this point and began to make our way back down. Swarth Fell ahead as we begin the off path descent. 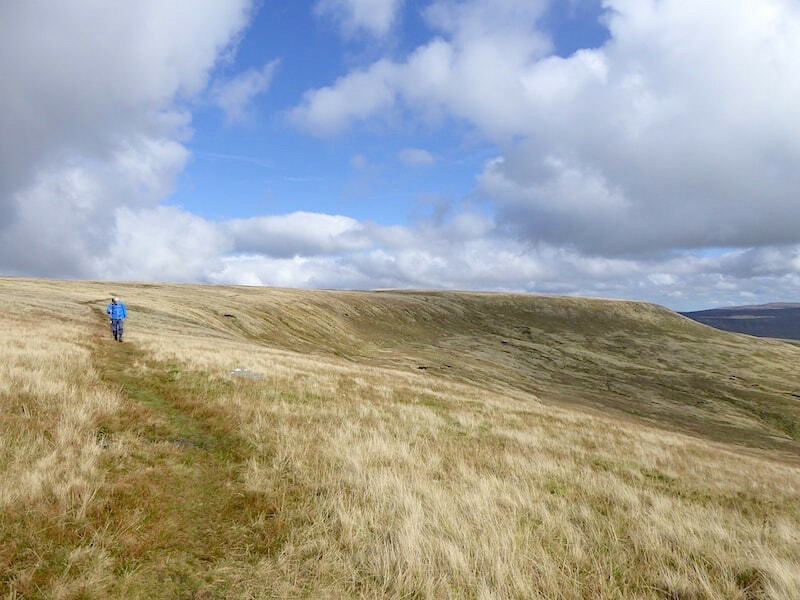 Golden grasses covering the slopes below Wild Boar plateau, and with the cloud broken, the sunny spells becoming longer and in the lee of Swarth Fell it wasn’t long before the jackets came off again. 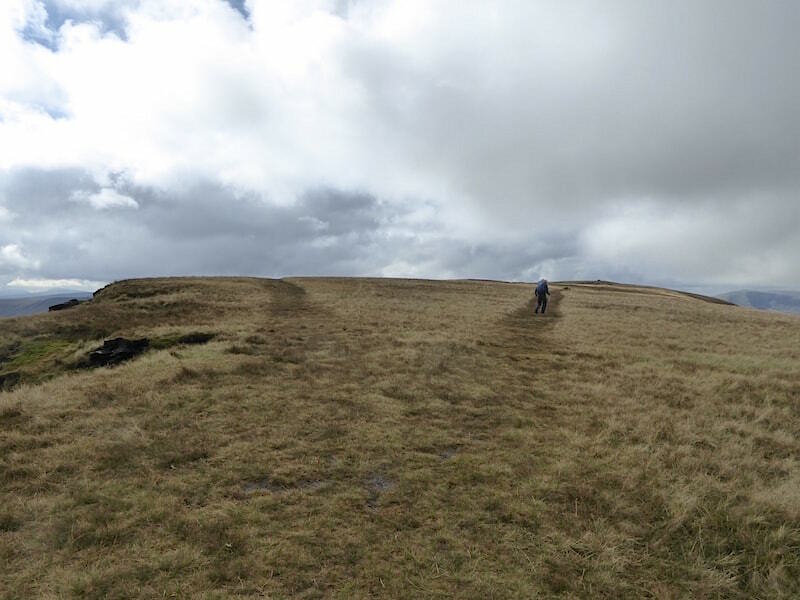 The off path descent was dry and straightforward enough but in the distance we could see peat hags and knew that we would soon be reaching the wetter areas lower down once again. 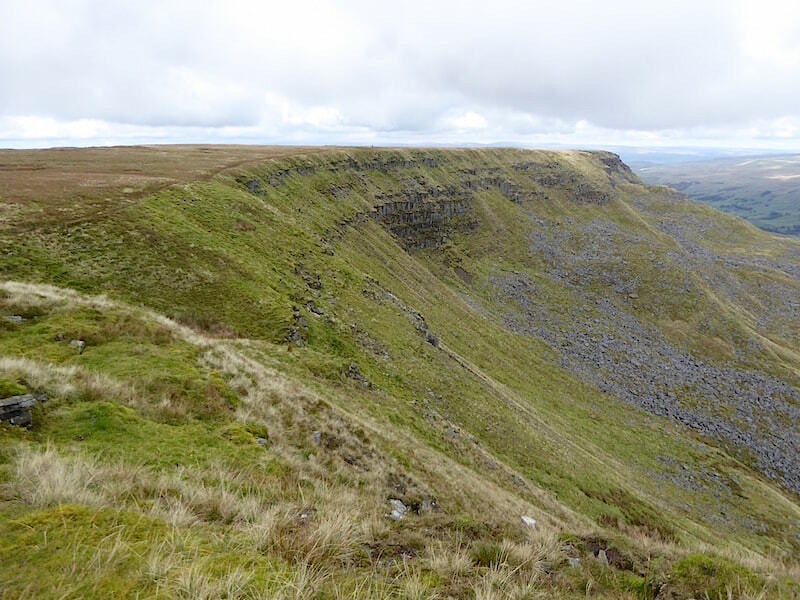 Just as they did on the outward leg this morning the views of Wild Boar were constantly changing and now we can see High White Scar and Low White Scar below the summit plateau. 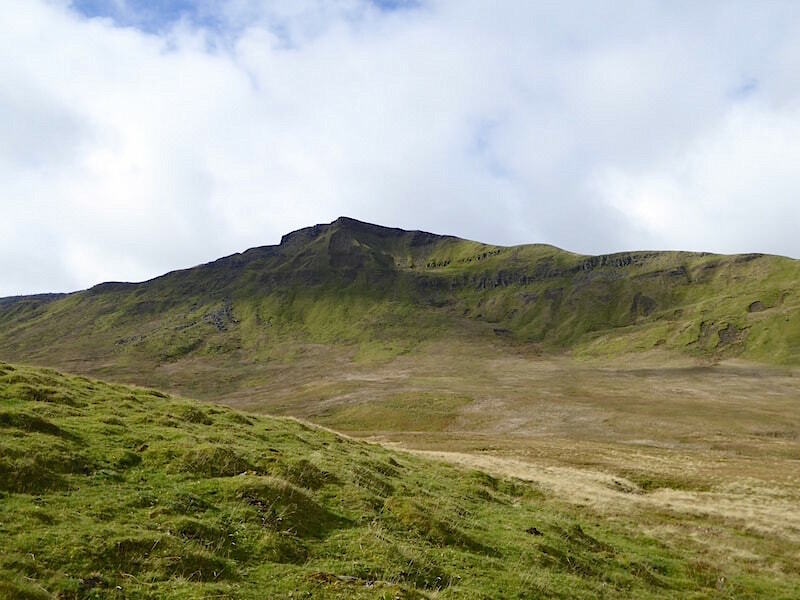 A look back at our descent route from Wild Boar plateau. 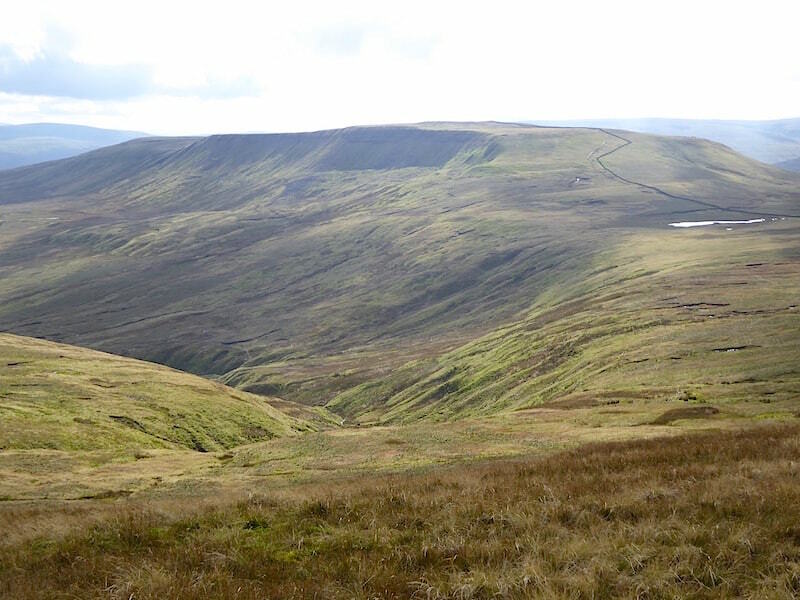 We’re in the lee of Swarth Fell and now well beyond the dip where the un-named tarn is situated. The spell of dry walking comes to an end as we reach the fence, which we follow all the way back to the car park. 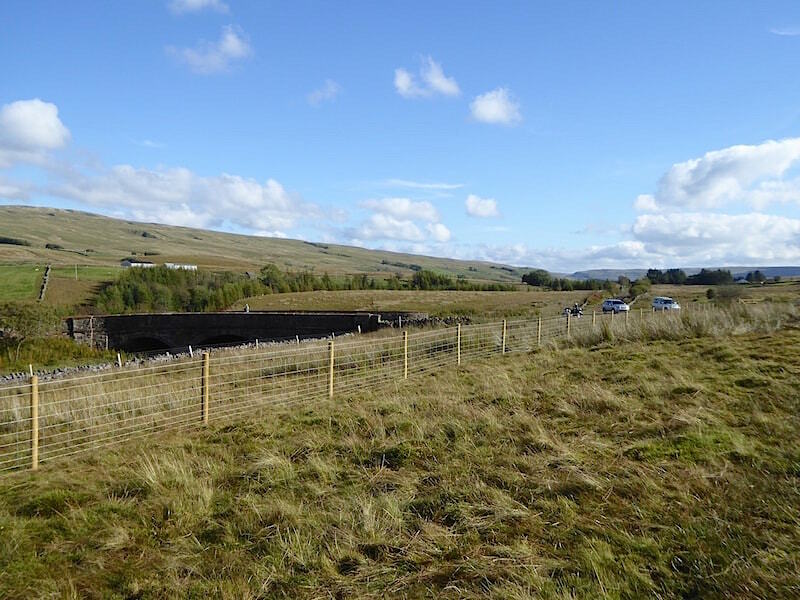 The grass was very flattened along the route and the caterpillar tracks of the silage delivery vehicle mentioned earlier were much in evidence. The flattened grass made it easier to see where you were going but it couldn’t do anything about the wetness. Clumps of rushes were in abundance along here, a sure sign that there will be plenty of moisture around and there was, so unless you wanted to walk in water up to your ankles, or even higher, there was nothing for it but to keep hopping from one bit of less wet ground to the next. It makes for slow progress. Up ahead is an area of peat hags too and the fence runs right alongside it so we’ve got that to look forward to. Just as well the afternoon has turned warm and sunny, at least it keeps the spirits up. We’re below the peat hags now and yes, their sides were soft and crumbly and the hollows between them full of thick black ooze or liquid brown water. Of course the path went straight through them and as we didn’t fancy falling in we scrambled up above the first one and then made a wide detour around them. Just above the fifth fence post from the right is one of the silage feeding points where about four or five wrapped bales have been deposited. 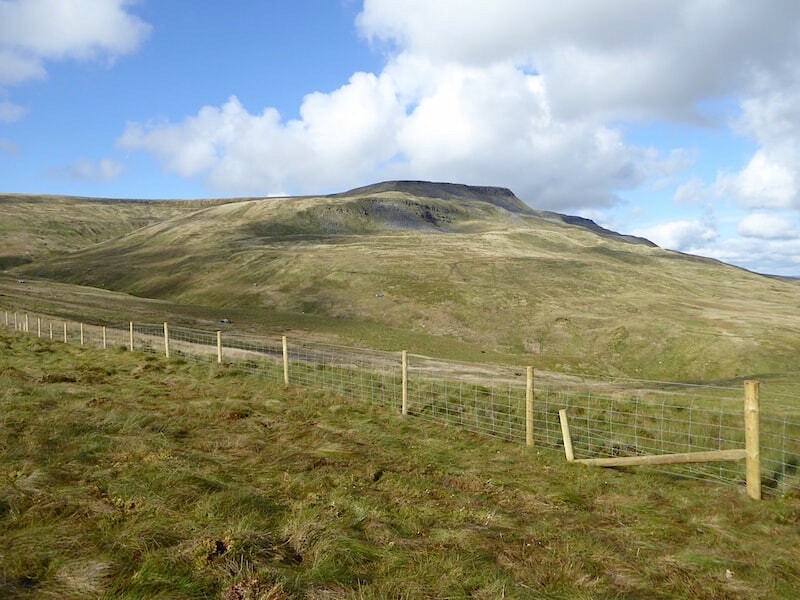 Still following the fence and across Ais Gill another aspect of Wild Boar presents itself. Everything looks so benign on such a sunny afternoon and I try to imagine the same scene on a cold, grey day in a January snow storm, brrrr! The fence guides us safely back to the car park with only a couple of little gills in the foreground left to cross before we splash our way down and across to the stile and gate just to the right of the cars. 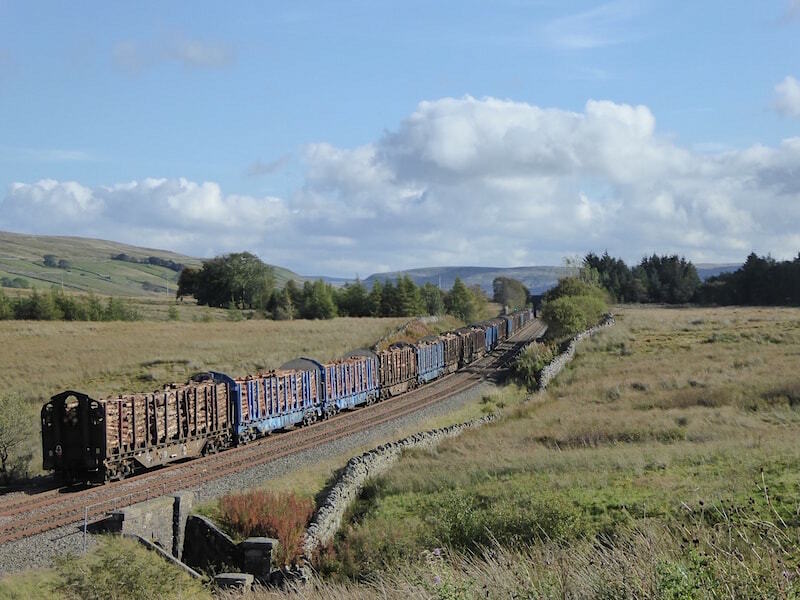 A commuter train on its way to Kirkby Stephen on the Settle to Carlisle line. 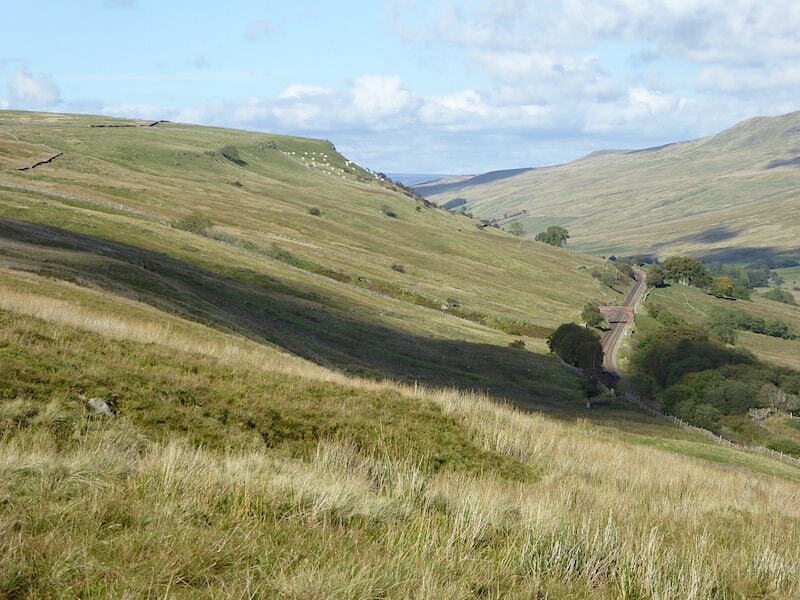 The railway line running through the Mallerstang Valley below High Bank. Across the top of High Bank is the wall we followed for a good part of the way this morning. Back on level ground once again but its no drier along here and it was impossible to use the gate thanks to the enormous pool of water all around it. The stile was on slightly higher ground so it made for an easier fence crossing. A last look back at Wild Boar now looking quite majestic and standing out very clearly against the blue sky. Back at the car and I had just dumped my pack into the boot when this came trundling along below us. I rushed to get the camera hoping for a shot before it disappeared …..
….. I needn’t have worried, it was a very, very long train so I had time to take a shot of the end of it as well as the beginning. 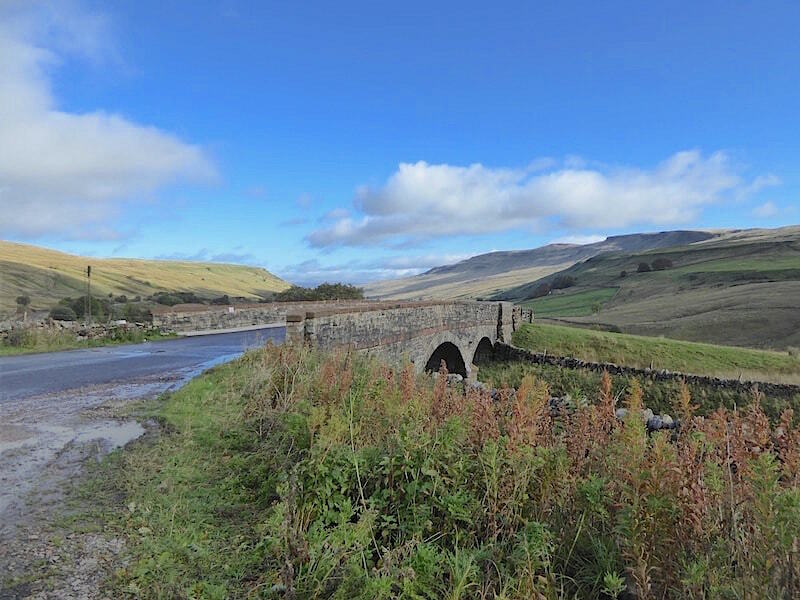 Before heading home we drove the short distance down to Aisgill Moor Cottages, pulled in at the roadside and walked the the few yards across to the viaduct with its view of Wild Boar Fell. 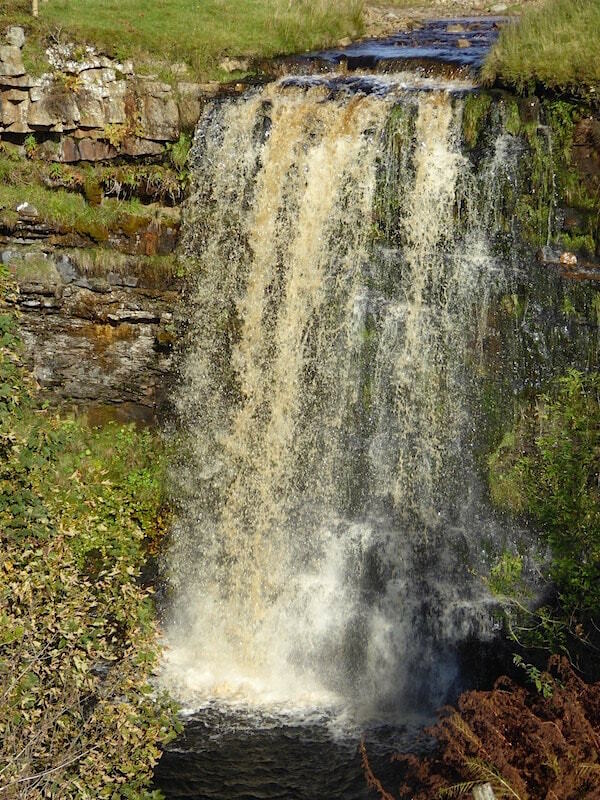 A left turn beyond the viaduct and a couple of hundred yards walking along a wide track brought us to …..
….. Hell Gill Force. 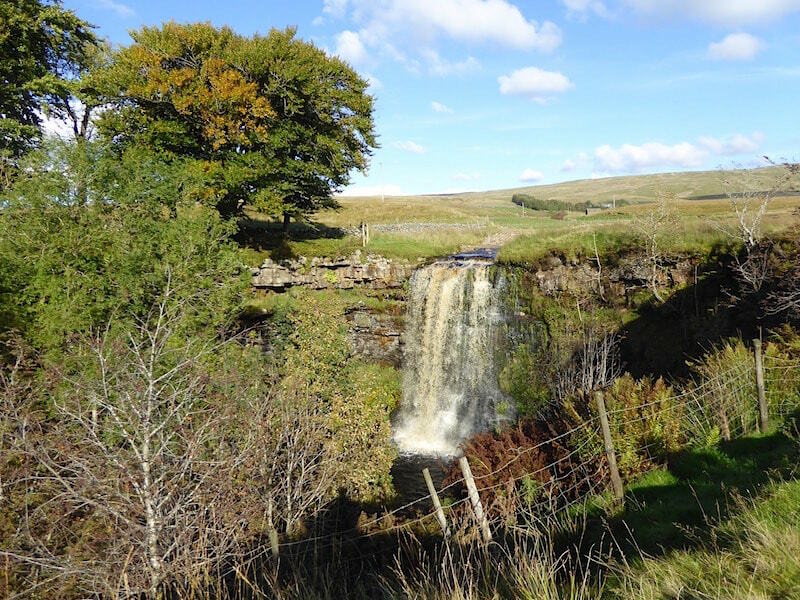 The gill which creates this spectacular fall starts high up on Lund Fell and is the source of the River Eden. This is a lovely little spot, the flat grassy area from which we viewed the falls has been nibbled down to bowling green standard by the sheep, there are numerous flat rocks to perch on and if we’d had anything left to eat we could have had a picnic here. The road and railway line are about a hundred yards behind me although hidden to some extent by the rise of the land. A lovely place to bring the afternoon and our walk to an end. A grand little walk and well worth doing, although next time I think it’ll be during a dry spell. The waterproof socks work a treat but it’ll take a couple of days for our boots to dry out, just as well as apparently there’s a week of wet and windy weather in store for us so we won’t be needing them anyway.